The long sun-drenched days in Vanxains simply glided by, our hours filled with nothing substantial but brimmed with relaxation and rest. We rewarded every two hours of strenuous physical effort, either running, walking, swimming or cycling, with double that of lazy sitting or lying in the garden, reading and watching the burning sun slowly drift across the sky. It’s a great balance for us, the daily exercise and the deliberate rest, and this easy luxury of filling our time exactly as we wish has a wonderfully cathartic effect. 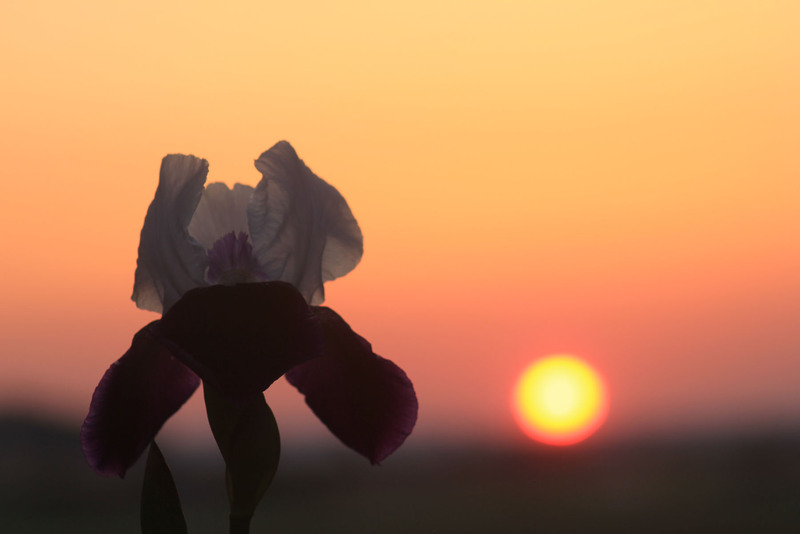 The hours and days of the week have constricted in their use to hold little meaning to us, as we now live solely on the timescales of the rising and setting of the sun, and of the changing seasons. 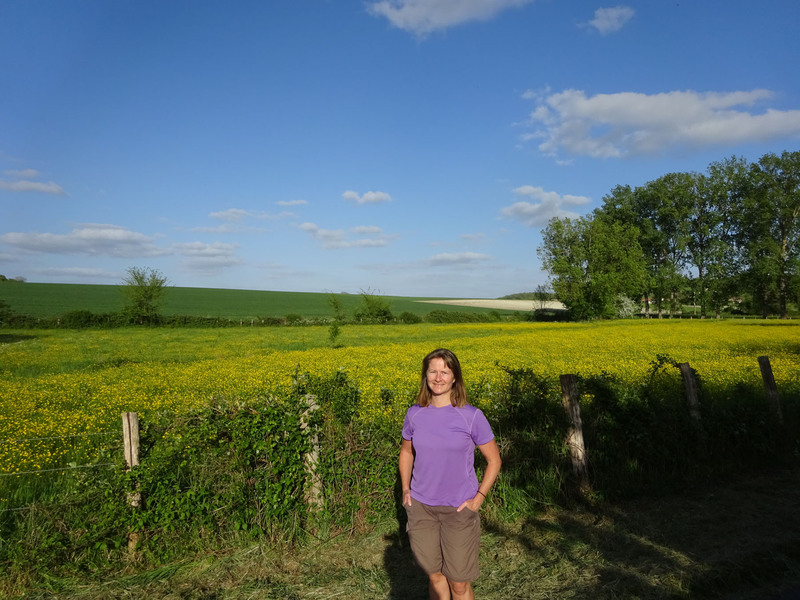 Nicky has an old university friend with a holiday home in Lacapelle-Biron, near to Monpazier, and we organised a visit for when they were in-country. 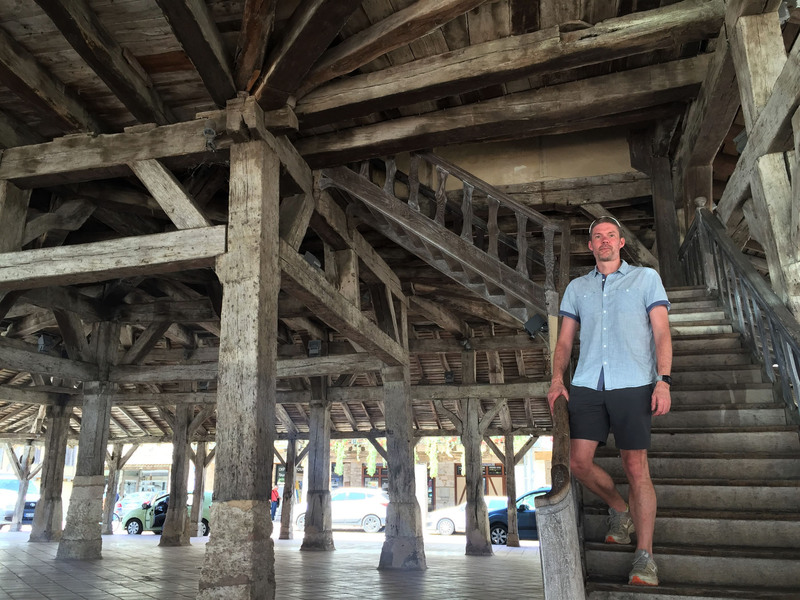 After a brief stop in Bergerac on the way, we enjoyed a flying visit to the bastide town of Villeréal, where we walked the historic streets, taking in the elaborate timber marketplace and tall stone church. Not long after, we arrived at Mandy and Simon’s villa, where we were soon splashing in their pool, sipping beers and swapping stories, all generously accompanied by birdsong and afternoon rays. We later retired to their patio for dinner and wine, eating and chatting long into the night, punctuated with earnest discussions on what music to play next. 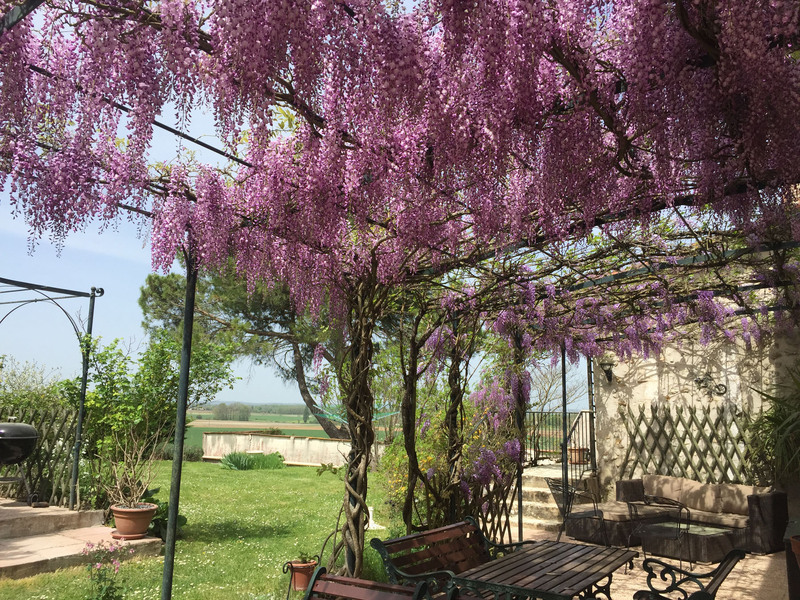 The following morning we ate a tasty late breakfast outside under the shade of a wisteria-covered pergola. We were, surprisingly and gladly, experiencing only the dull hint of the fully-expected hangover. 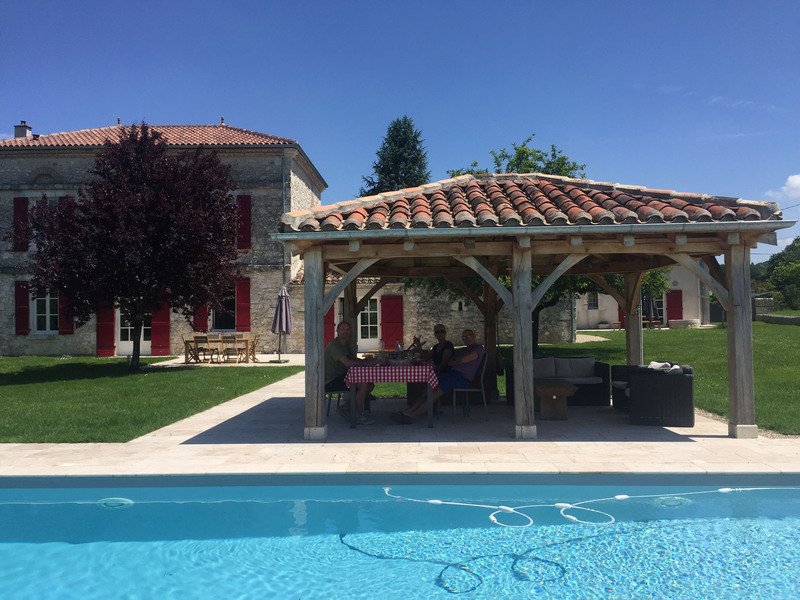 We said our goodbyes as we had another lunch date with Ken & Monica in Cazeneuve, which was spent relaxing by their pool, complete with much more chatting and eating. 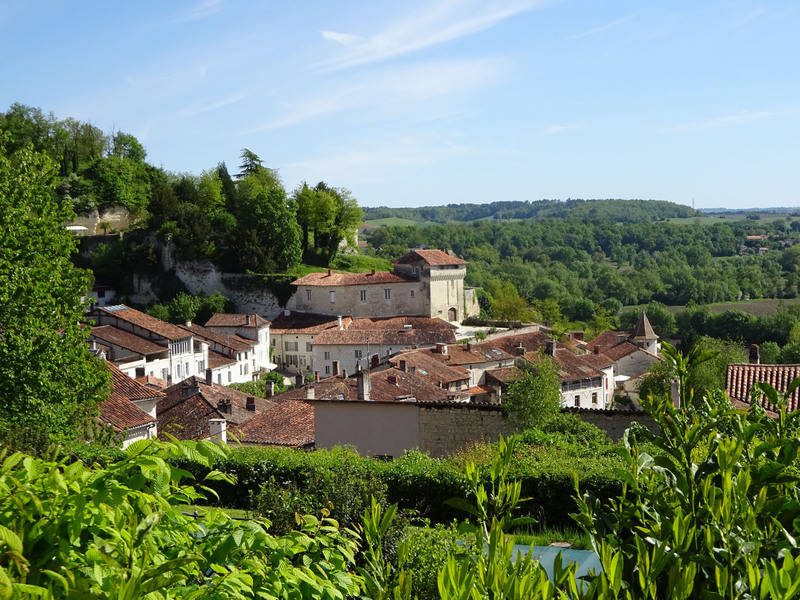 It was fascinating for us to see Cazeneuve blossoming into summer, such a different appearance from before. Every vista was now green, lush and fruitful, more opaque with dense foliage than the skinny, dormant mud-browns of the winter months we had recently spent there; it was transformed. 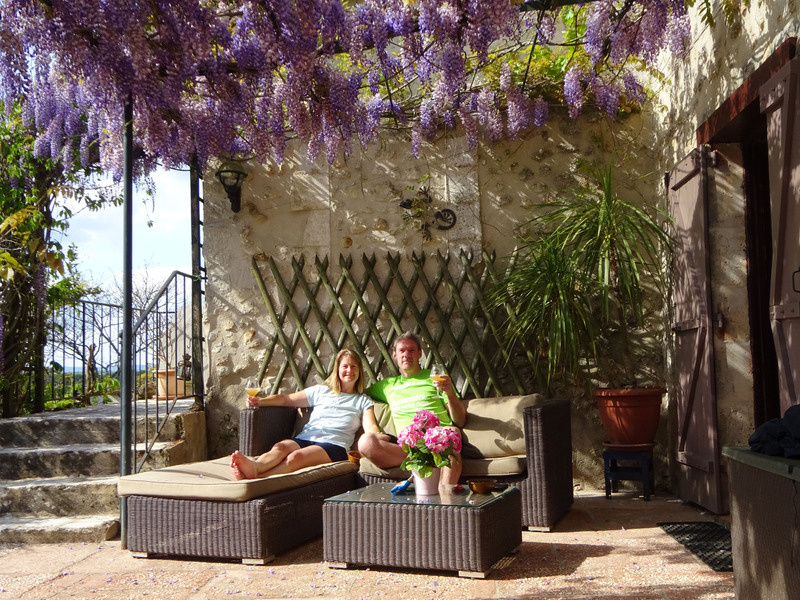 Monica & Ken were expecting the arrival of an Australian couple later that afternoon, their guests under Home Exchange, a scheme that we hope to utilise in future years with our new French home, opening up more travel options further afield. We thanked them for lunch and left them to prepare for their far-flung visitors. 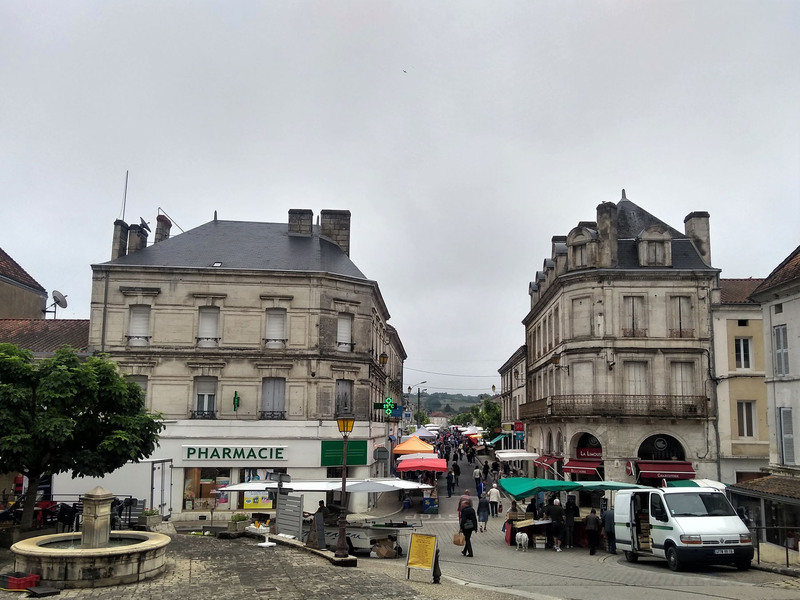 One damp Monday morning, we decided to drive to the nearby market town of Chalais. 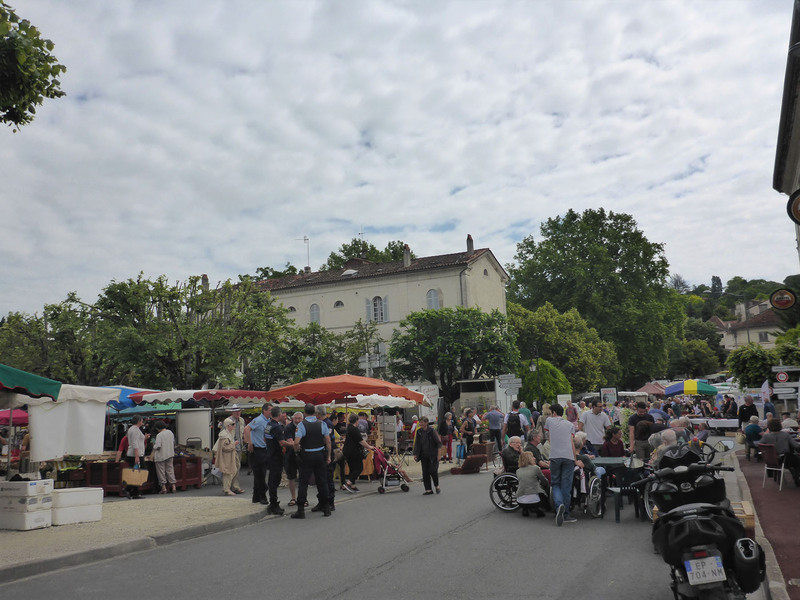 We had been informed it was one of the most worthwhile local markets to visit, but on a dull, grey day under the constant threat of rain it seemed rather small and basic. Perhaps this was because the scattering of stalls were widely spaced out along many streets, rather than clustered together in a central location, and the day’s meagre crowds didn’t stretch wide enough to offer a hearty noise or an interesting buzz. 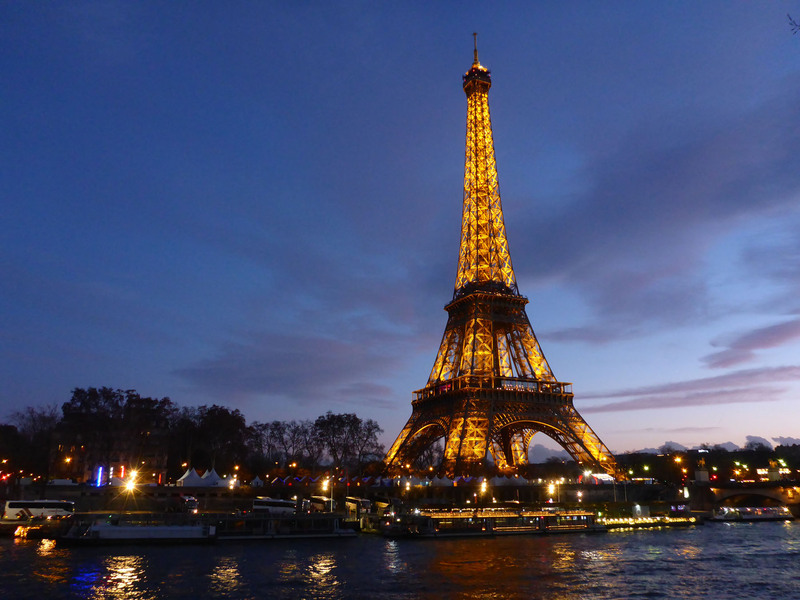 Or perhaps we had so recently been spoiled by the large markets in Issigeac and Ribérac that we were anticipating more, our personal expectations raised and dashed through no fault of Chalais. 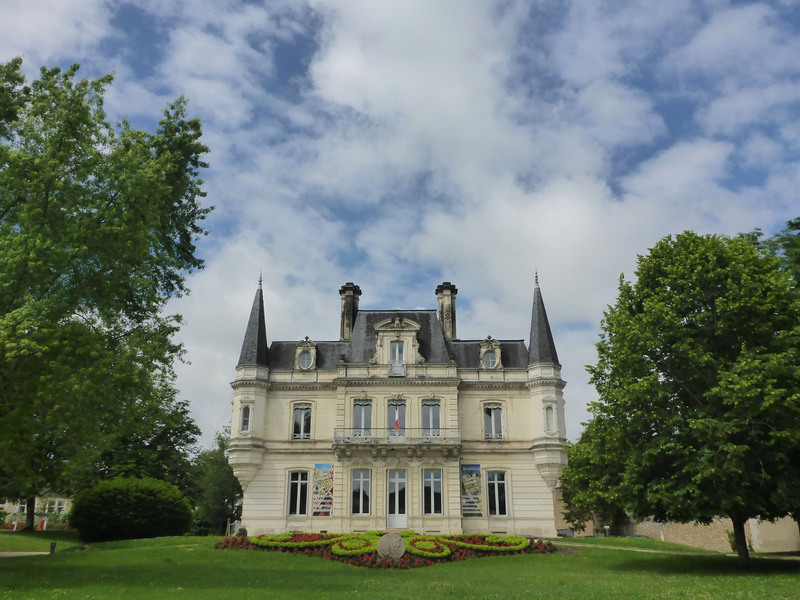 We walked up a steep hill to look at the local château before disappearing back through the wet streets. 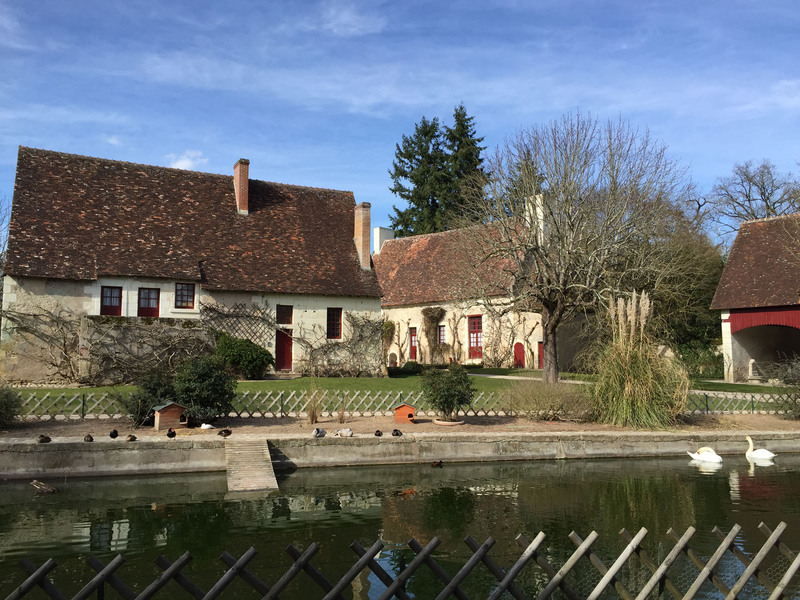 Another day we visited the village of Saint-Aulaye, where we squeezed through a tight timber gate to access the ample parking before undertaking a self-guided walking tour of the village’s Roman highlights. 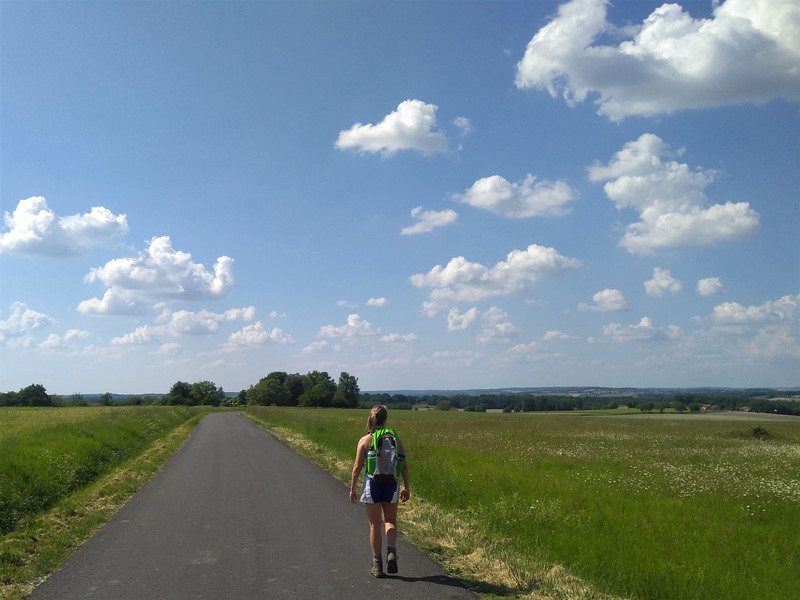 We kept up our schedule of long countryside runs and quiet evening walks, punctuated with lots of down-time, disguised in our minds as ‘recovery’. 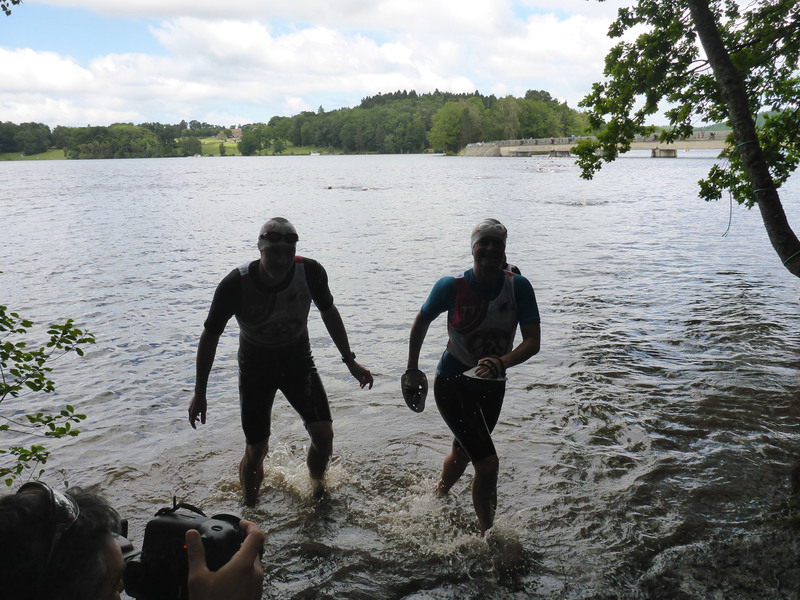 We enjoyed several more swims and runs around Jemaye lake, further training sessions for our upcoming SwimRun event. On several occasions we experienced serious thunderstorms and minor flooding at the house, interspersed with momentary losses of electricity. Once these storms broke, we were usually treated to wide-reaching and spectacularly deep sunsets across the expansive valley, all visible from the bottom of the garden. 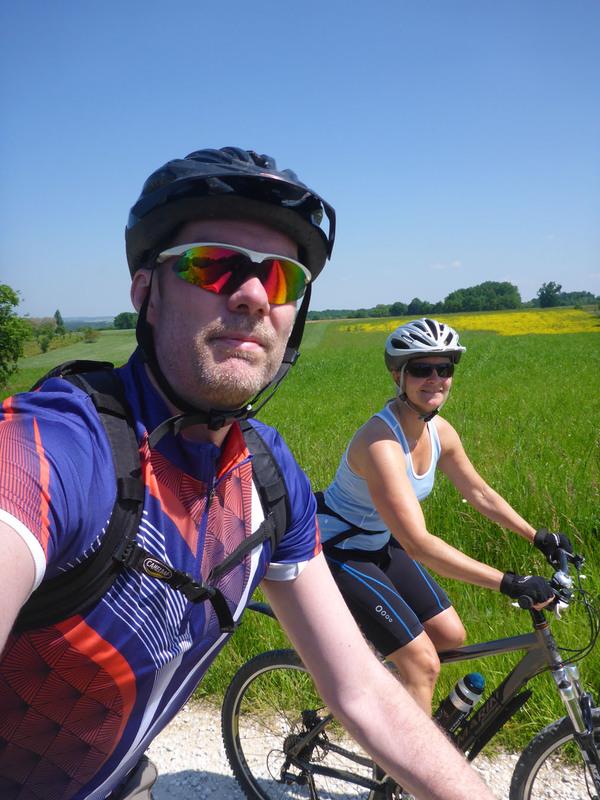 On our last Friday we cycled a beautiful cross-country route vaguely northwards, on chalky paths and tiny roads, their grassy centre-line a testament to the lack of use. 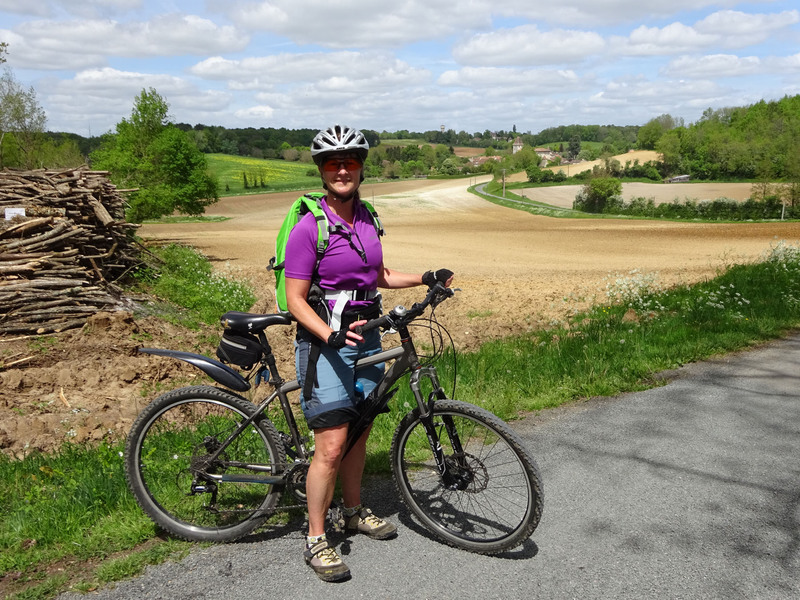 We struck out a winding route into the west of Ribérac, dropping down into the edge of town via a fantastic descent through wheat fields on a stony path. We weaved through the neat suburbs before we again joined the crowds at the weekly market. The conversational buzz and bright colours of the busy centre were striking in contrast to just moments before, where only the muted colours and tweeting noises of the countryside existed. We parked up and walked a loop, enjoying the contrast with the green silence. After exhausting the market stalls, we had a quick stop at the Hôtel de Ville before cycling out of town. We returned home by a new route, finding a quiet stretch of road alongside a small trickle of a river, it passing through woodland filled with the bending trunks of tall, graceful trees. 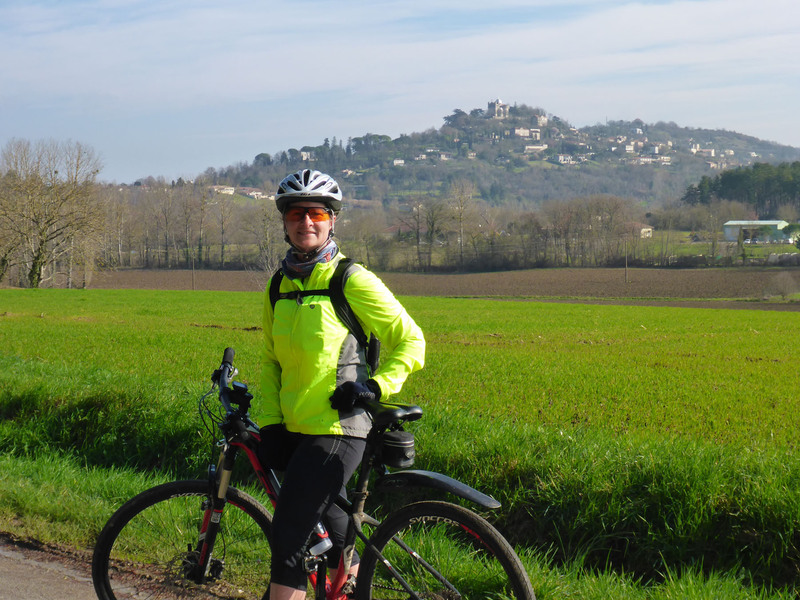 The route was a continuous ribbon of green rolling hills, each crest offering far-reaching views of the surrounding lands, made up of expansive hectares of manicured fields with only a light scattering of stone houses and outbuildings visible. The fields were planted with barley, sweetcorn and sunflowers, still small and green, but ensuring the vista would evolve yet again, to be resplendent with brilliant yellows in the months to come. Legs tingling from our efforts, we settled back into our lazy garden life, soaking up the sun in the close company of cats, again feeling like the ones who got the crème. 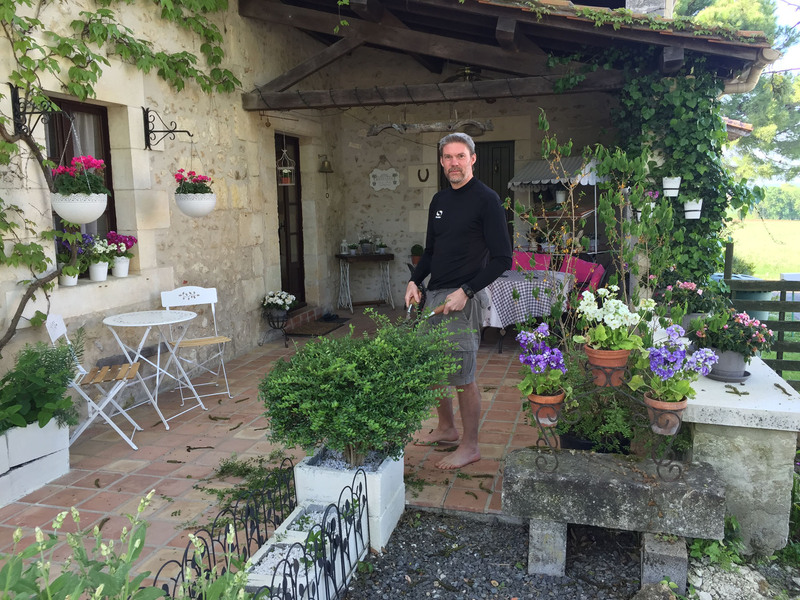 We spent a large part of the day readying for leaving – we packed up all non-essentials, tidied up the house and, under a scorching sun, completed a last cut of the fast-growing garden. With everything in good shape, we decided to make a little micro-adventure for ourselves after dinner. 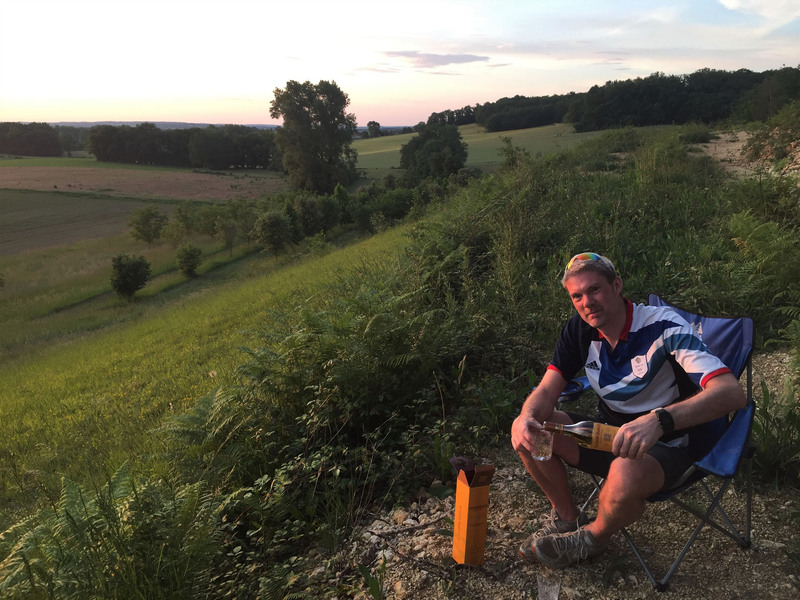 We took our camping chairs and a bottle of single malt with us and walked up a local grassy chemin to a nearby hillside, where we took up temporary residence on a gravel plateau to enjoy the setting of the sun over the lush valley. 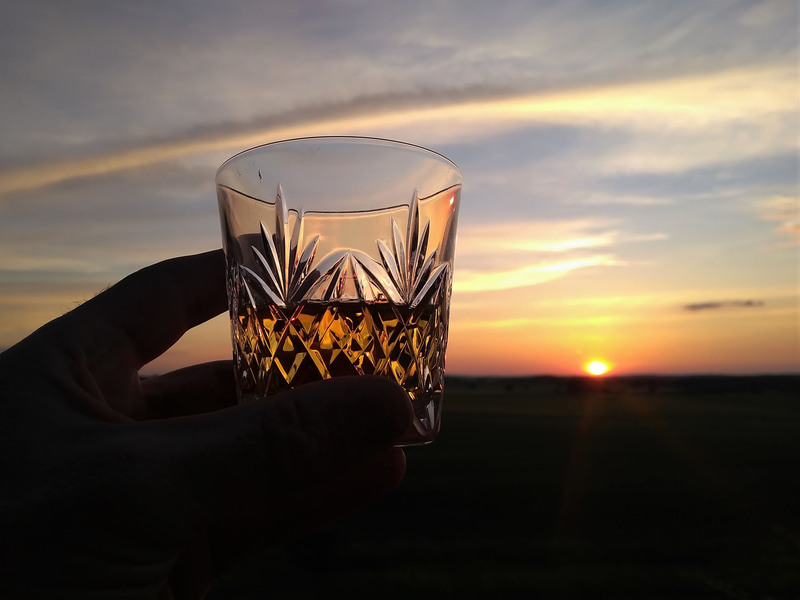 We settled in, each poured ourselves a glass and sipped in silence as the sun slowly disappeared behind the horizon, just like the fun-filled days and weeks we’ve spent here have now vanished into the past. 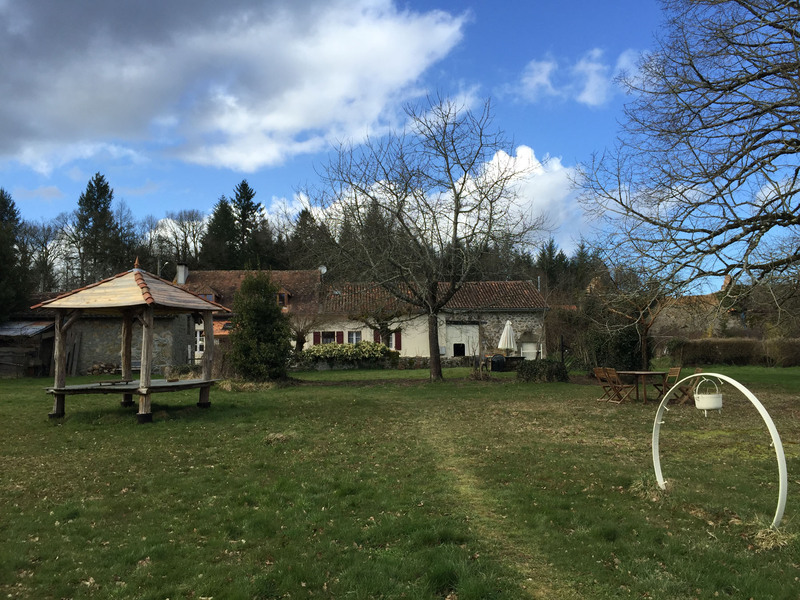 Here was the end of another, very different but equally wonderful, house-sit, and we felt so fortunate to have been offered the opportunity to spend such quality time in these peaceful surroundings. 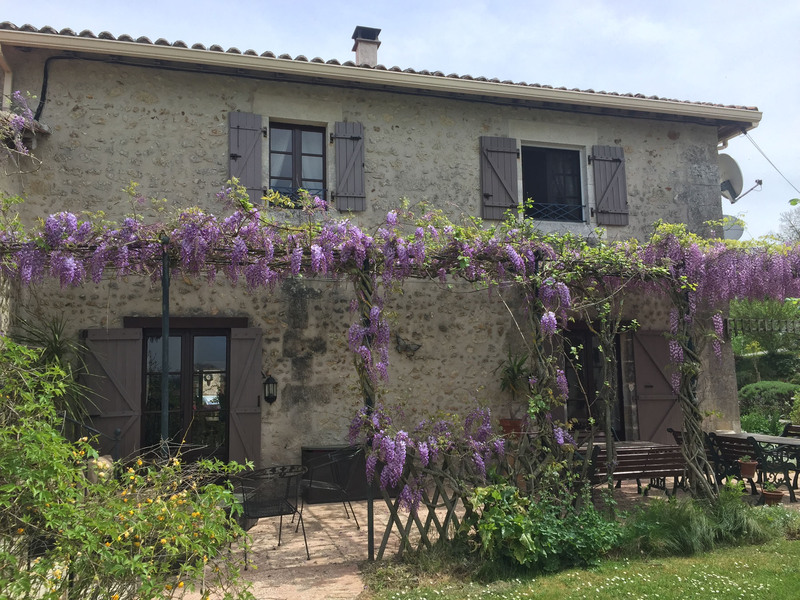 This entry was posted in 2018 Summer Tour, Cycling, France, Hiking, Housesitting, In France, Our Travel Journal, Swimming and tagged cats, Cycling, forest trails, gardening, gardens, Housesitting, lake, lake swim, markets, nature, relaxing, sunset, Swimming, trail running, walking, wine on Jun 18, 2018 by Aaron Hill. 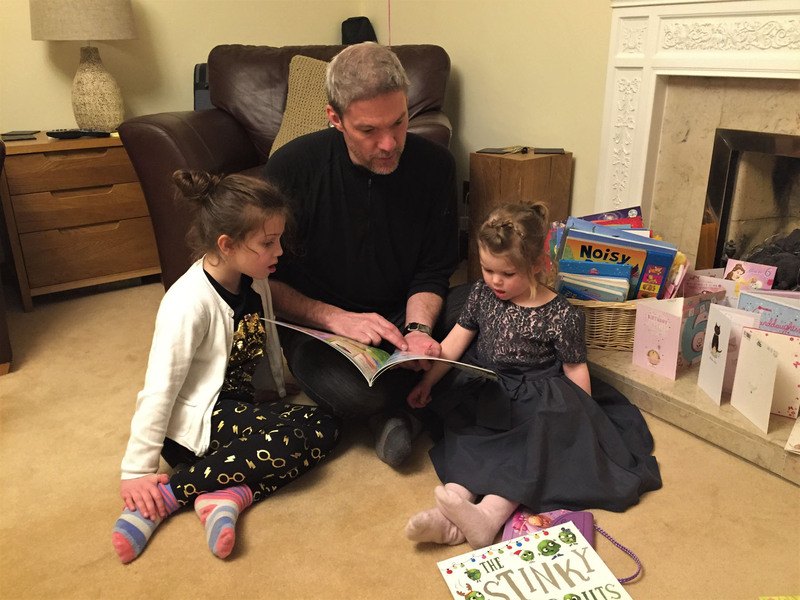 Our days have continued to pass much as they have done for much of this house-sit to date; filled with short bursts of frantic activity framed with large doses of lazy sun-worshipping. Or, when rains arrived, and they really arrived, catching up on missed TV shows, movies or books, whilst marvelling at the tropical-like deluges ripping up outside our windows. It’s been a varied and interesting stay to date, a fine mix of activity, exploration, reading and rest. 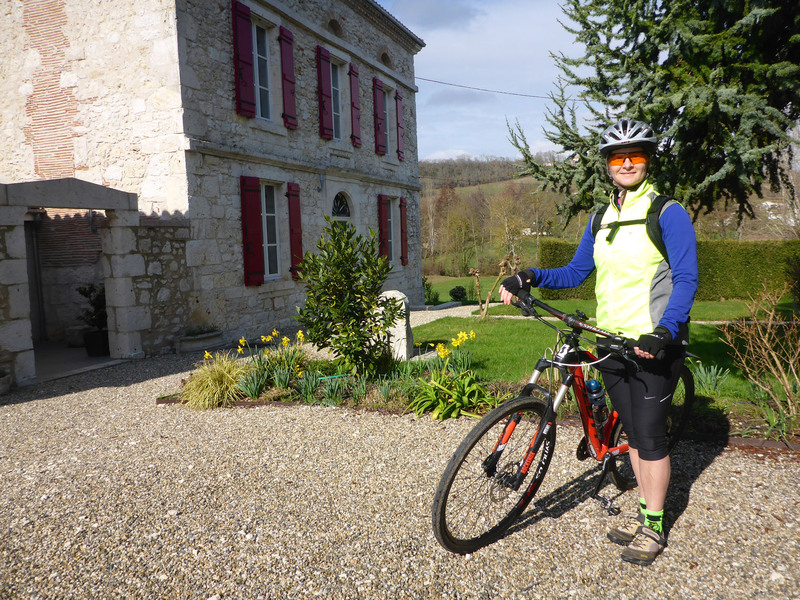 One fine day we decided to cycle to a nearby beaux village of Aubeterre-sur-Dronne – 14km of hilly cross-country with a few off-road stretches on dusty, chalk paths that reminded us of the South Downs Way in England. Avoiding all main roads, we soon reached a campsite on the outskirts of the town and stopped in to admire their public swim beach on the river; it looked like a nice aire to visit should we be back here in future days. From there we followed a steep cut-back uphill, passing the entrance to cliff-face caves, to reach the beautiful, shady main square. 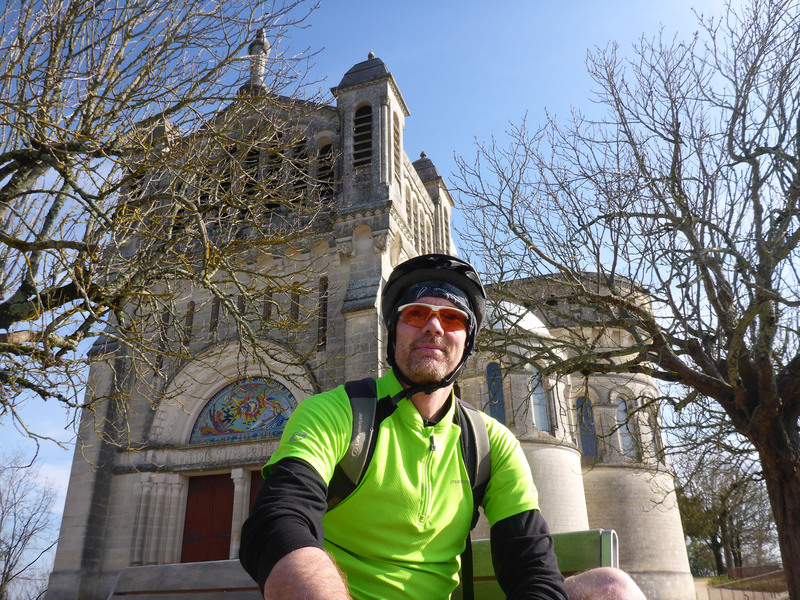 We locked up our bikes and walked around the pretty centre, through steep, narrow streets, visiting the dominant stone church before buying a baguette back at the main square for lunch. We sat a while and people-watched in the glorious sun. 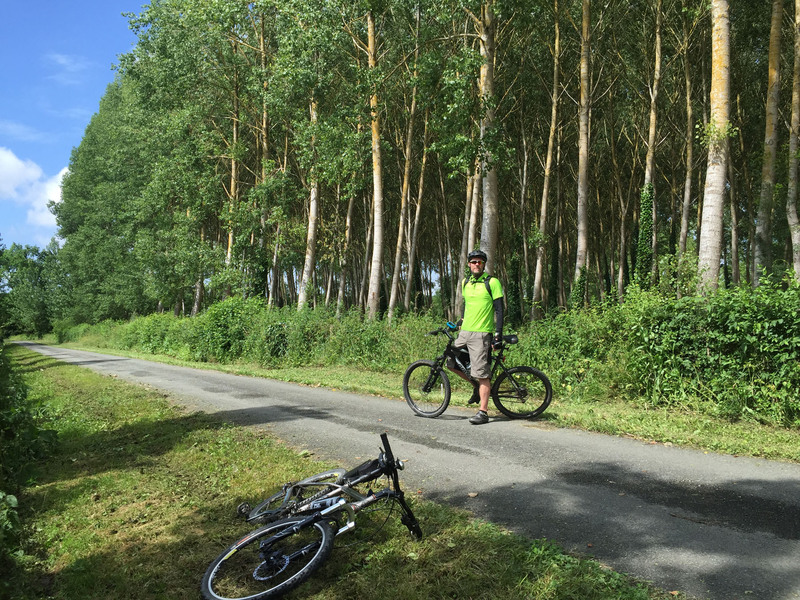 Another day we cycled the 16km to Bertric-Burée, with the intent of attending an advertised Snail Festival. 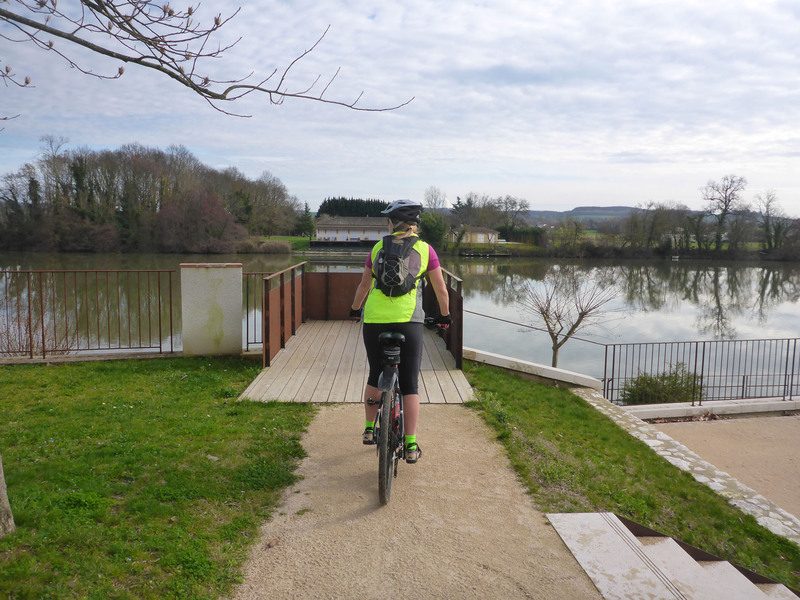 We crossed the calmly flowing river Dronne at Épeluche, sticking to rural back routes and quiet gravel trails on the way. It was a beautiful cycle, but it turned out we chose the wrong day; the three day local festival had a different focus each day, and the snail stalls would only appear on the Monday, not the Saturday. Even then, the festival began after lunch, 2pm, so there was nothing open when we arrived – zut alors! 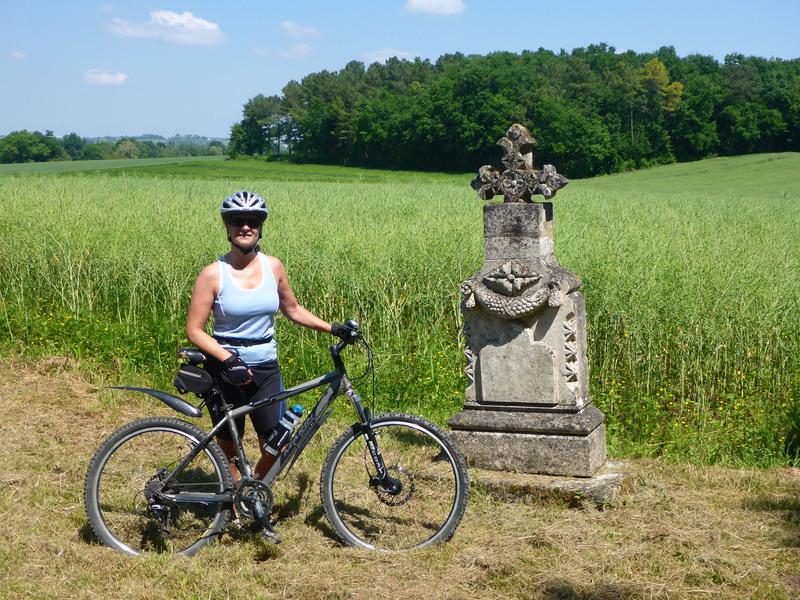 Still, it had been worth a look and the car-free roads offered some fantastic cross-country cycling. We considered a return in two days, but that weekend turned out to be scorching hot, so instead we spent it vegging in the garden, slowly pottering with the blooming plants. Another day we went for an 11km countryside run in the early morning, but it was still not quite early enough. The day was not yet 9am but already a blistering 25 degrees, and had not a breath of wind. We ran along many beautiful tracks and passed through a few sleepy stone villages, but we were both a hot, sweaty mess when we got finally got back home. We had a quick, cold shower then headed straight over into our neighbours’ pool, where the cool water sizzled from the heat of our skin. 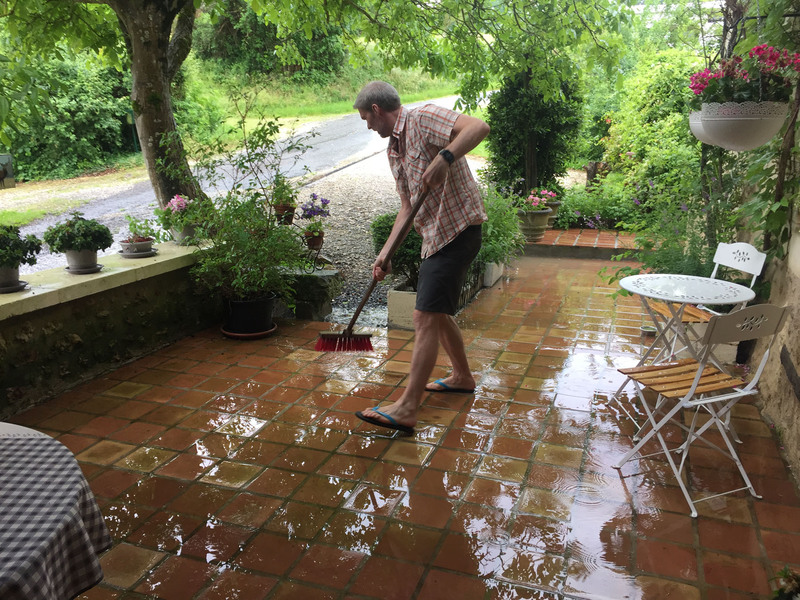 It was such a refreshing feeling to cool off properly after some good work in the repressive heat, and made us glad that our recently purchased house comes with a pool. The following day, in deep contrast, we spent a very rainy afternoon mooching inside, and got our UK tax returns and other paperwork sorted. 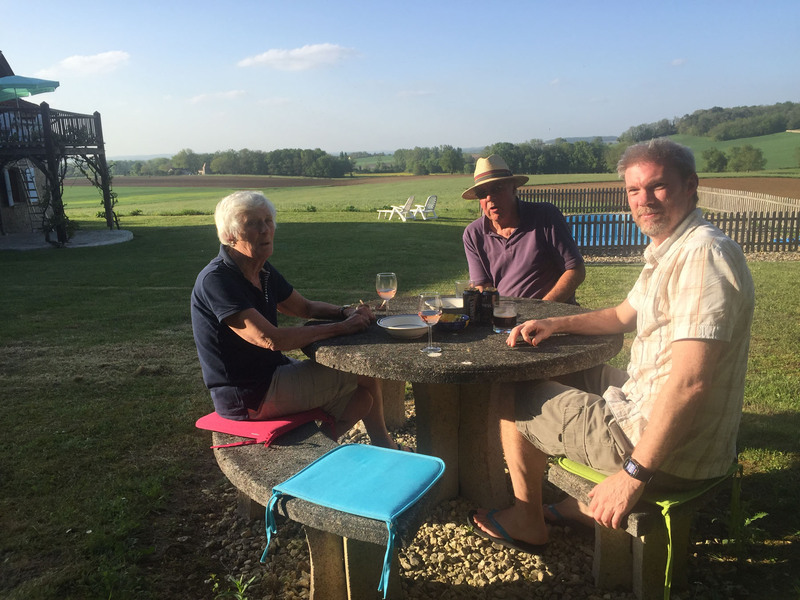 Returning from one walk, we popped in to see neighbours Judith and Pierre, and invite them to apéro later in the week. We agreed that the coming Saturday was best. They arrived shortly after the agreed 6pm and we spent a happy hour and a half chatting with them, half in French, half in English. We drank lots of wine and nibbled at the bruschetta and other savoury snacks we prepared. We had no experience of what apéro should be like or what their expectations may be, this being our first with actual French neighbours, but we seemed not to have offended too greatly. 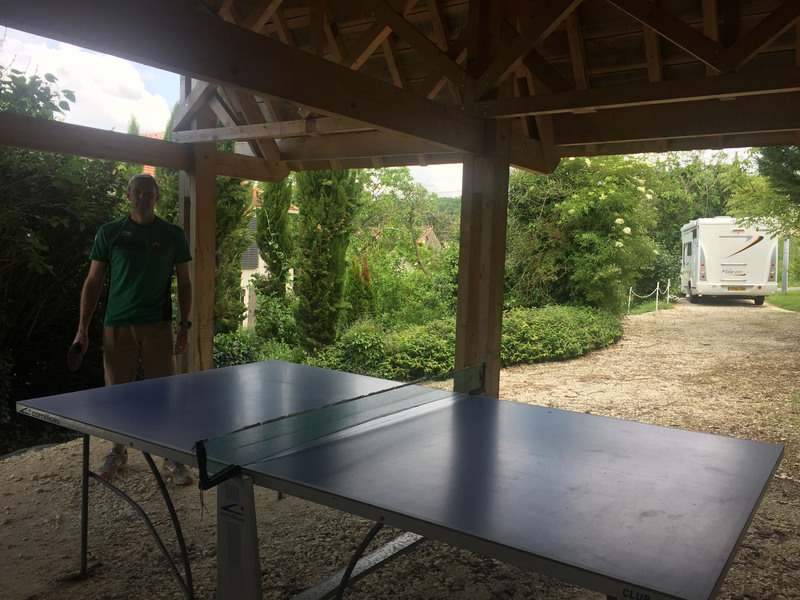 We mentioned we had spotted a table tennis table in their garden, and Pierre said that it had sat unused for five years, so we could borrow it. 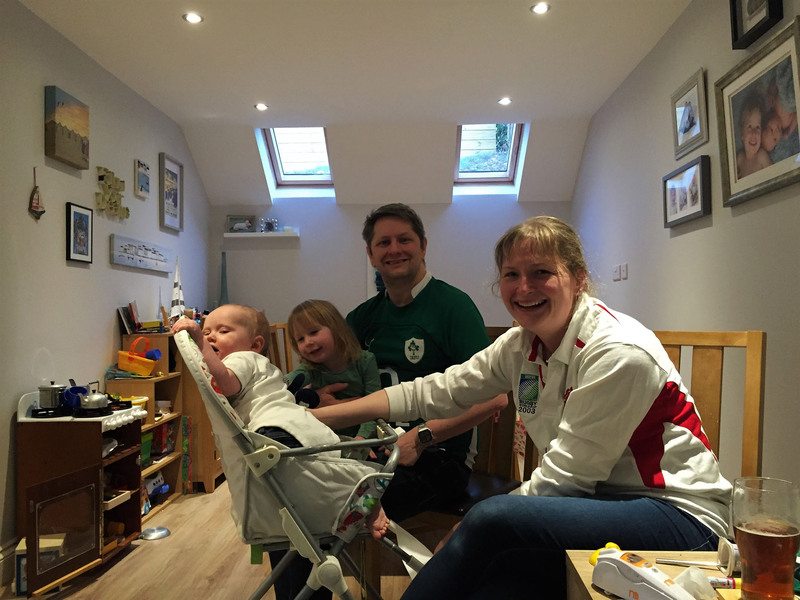 We jumped at the offer, and he delivered it to us the next morning – excellent! 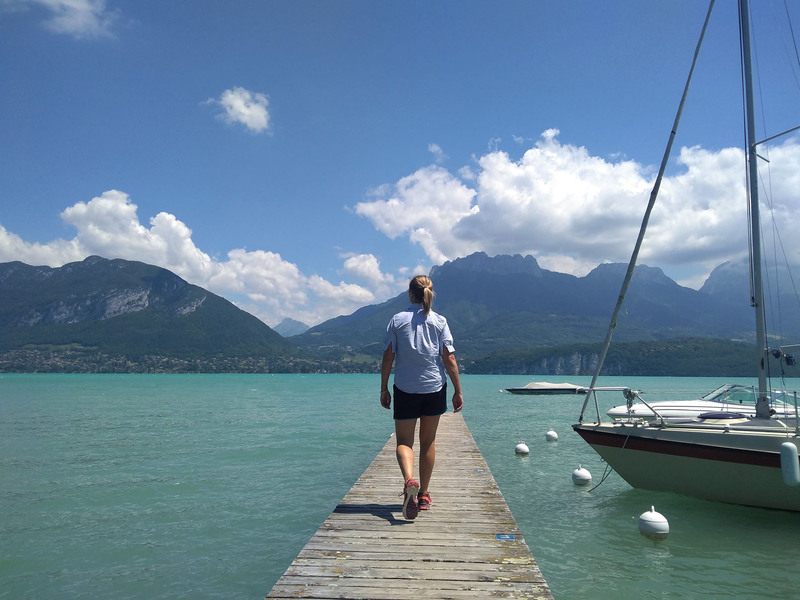 We continued with more swim-run training sessions at the Lake Jemaye, returning several times to enjoy long swims or short bursts combined with various transitions and runs. We rarely saw others there, other than a few staff members tasked with woodland maintenance or beach clean-up. 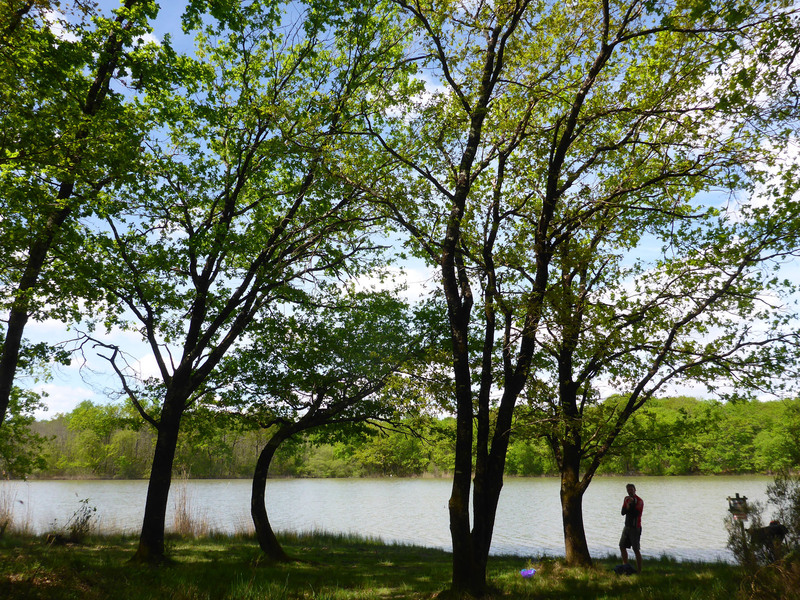 Even after bouts of heavy rain, the lake water remained comfortably warm and we revelled in the solitude, in contrast to what we imagine the short, hectic summer months must be like in such well-provisioned place. 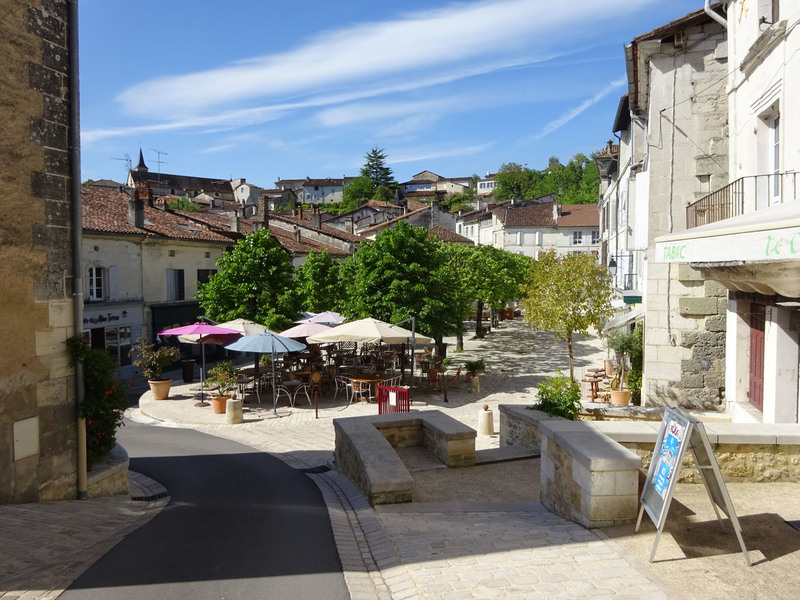 On one occasion we arrived on a French Bank holiday and had a taste of what it must be like in summer, the place brimming with motorhomes and cars, with large tables laden with food and wine everywhere, everyone enjoying the sunshine. We were still the only swimmers though. 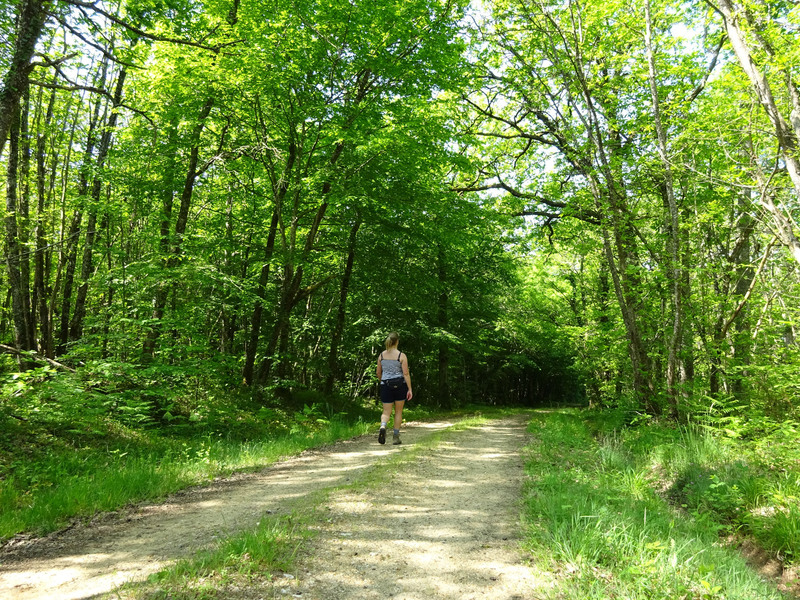 We took long day walks in scorching heat, exploring the nearby hills and woodlands. We played games of table tennis nearly every day, although in all the time there I took only one game off my annoyingly talented wife. We continued to dabble in necessary gardening, although the lawn had recently developed a spiky infestation that had suddenly made areas of the garden extremely treacherous to bare feet. We initially suspected it was a kind of invasive knotweed, but later discovered it was self-seeding bamboo. 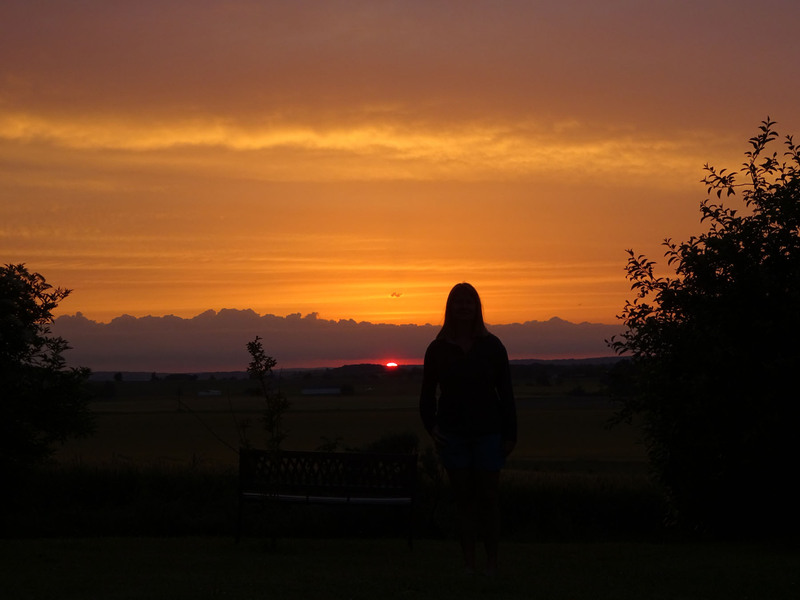 We enjoyed wonderful, red-bursting sunsets almost every night from the west-facing garden, settling into little rituals that gave a semblance of structure to our easy existence. We had a forged a slow, humble life, free from encumbrances, filled with exercise, outdoor-living and simple pleasures. 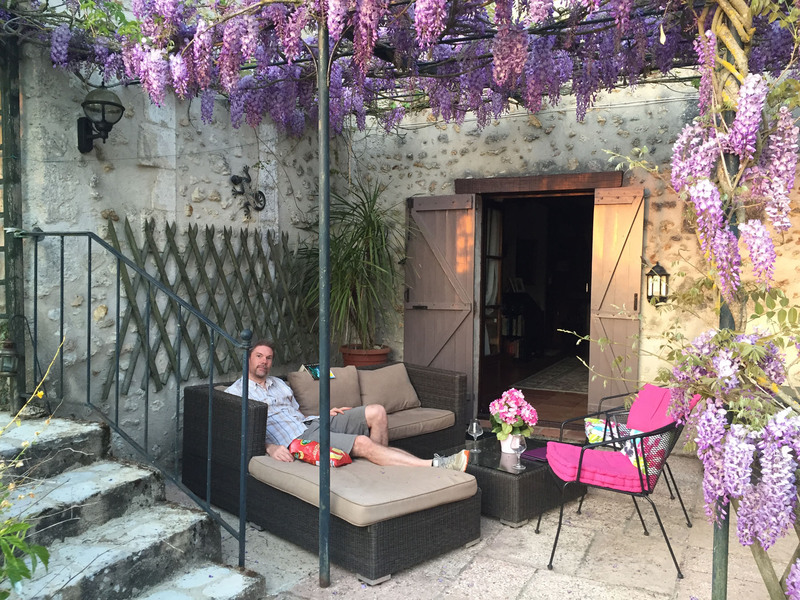 This entry was posted in 2018 Summer Tour, Cycling, France, Hiking, Housesitting, In France, Swimming and tagged apero, cats, Cycling, gardening, gardens, Housesitting, lake, lake swim, markets, nature, relaxing, Swimming, trail running, walking, wine on Jun 10, 2018 by Aaron Hill. When we originally organised this house-sit, we thought it would offer an ideal base for house-hunting, but with that now ticked off, we would have little to do but relax and, hopefully, enjoy weeks of pleasant sunshine. 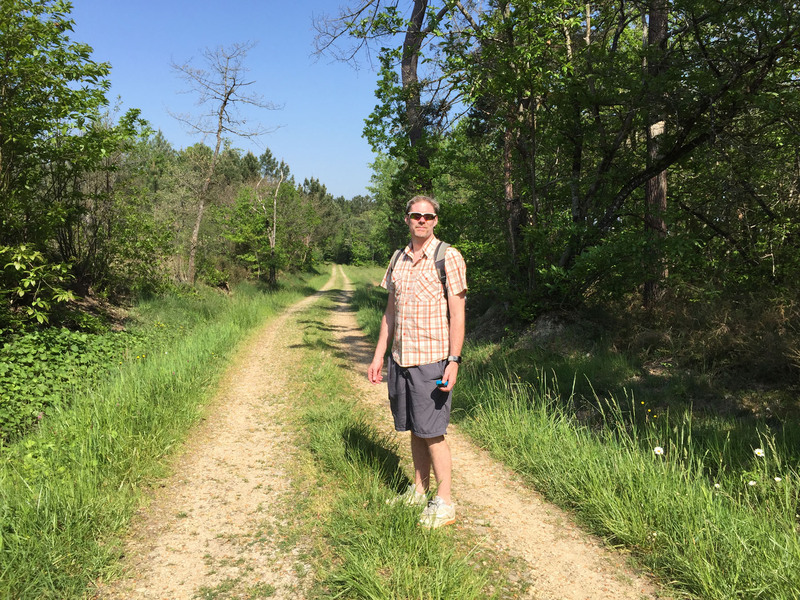 We now hoped to spend quality time at the nearby Grand Etang La Jemaye and called in on our way up from Saurzac. It had an excellent set-up, with dedicated motorhome parking and a beachfront restaurant, but weirdly the entire lake edge was lined with “baignore interdit” signs. We asked and were told to ignore them if we wanted to swim, it would simply be at our own risk, so all good. 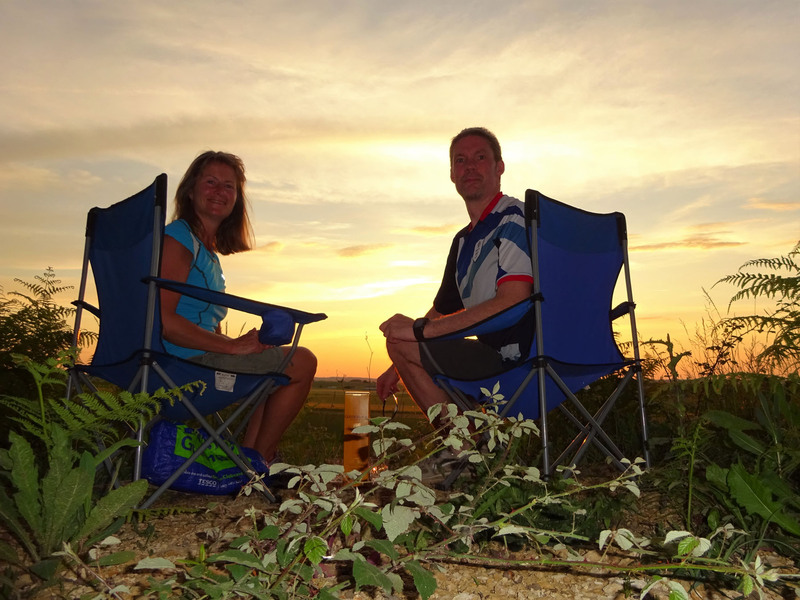 We soon arrived at Vanxains, met up with Eric again, and had a lovely dinner with him and his partner Lorraine. 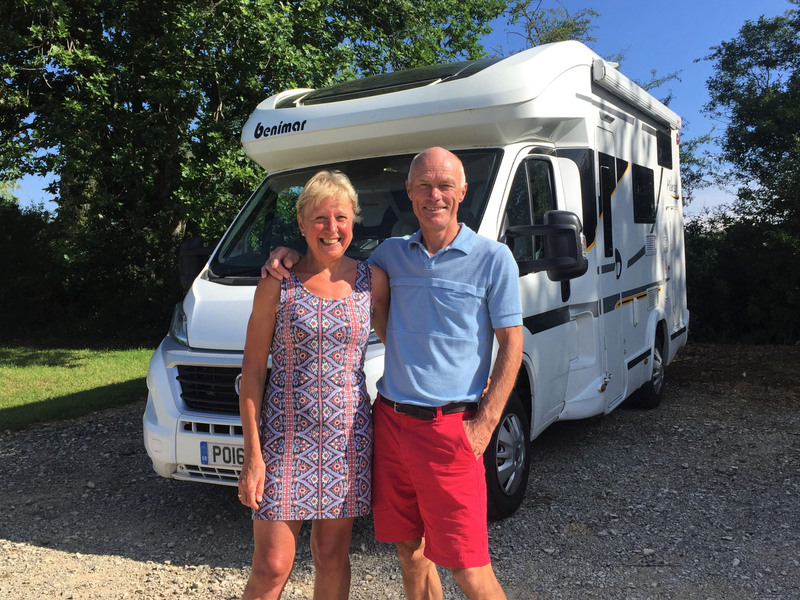 We were introduced to their friendly French neighbours Pierre & Judith, charged with being our local assistance should we have any issues during our stay. It would be a very pleasant spot for us to spend our next six weeks. We had two cats to look after, Rosie & Sweep, but they seemed to be no trouble at all, just coming and going as they pleased. Eric’s house was up for sale, and in our first two days we had three separate house viewings – the first two led by agents and one unexpected later in which we led the viewers, a couple from Leicester, around the property selling it to them as if it was our own. 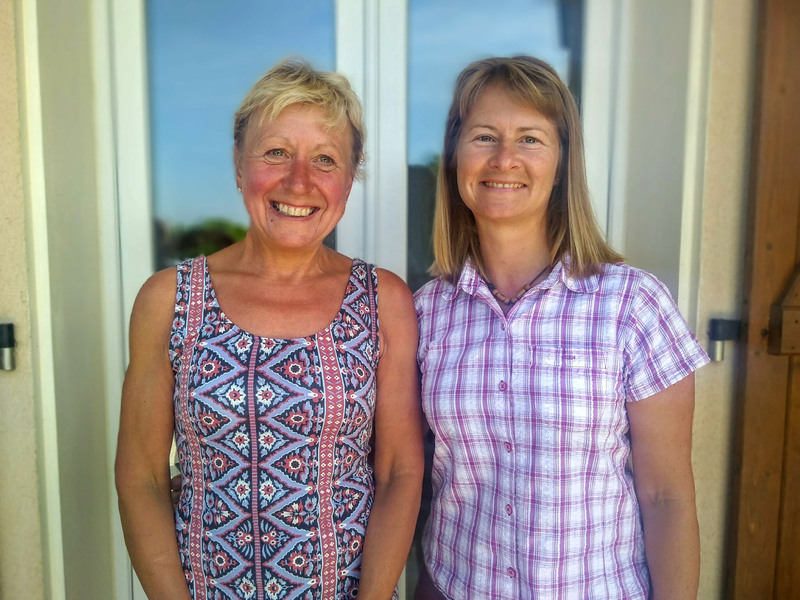 We had a flying visit from Monica and Ken, from our previous house-sit in Cazeneuve, for lunch and a chatty catch-up. They had ridden up to visit us on their motorcycles, enjoying the winding country roads and dry, sunny weather. 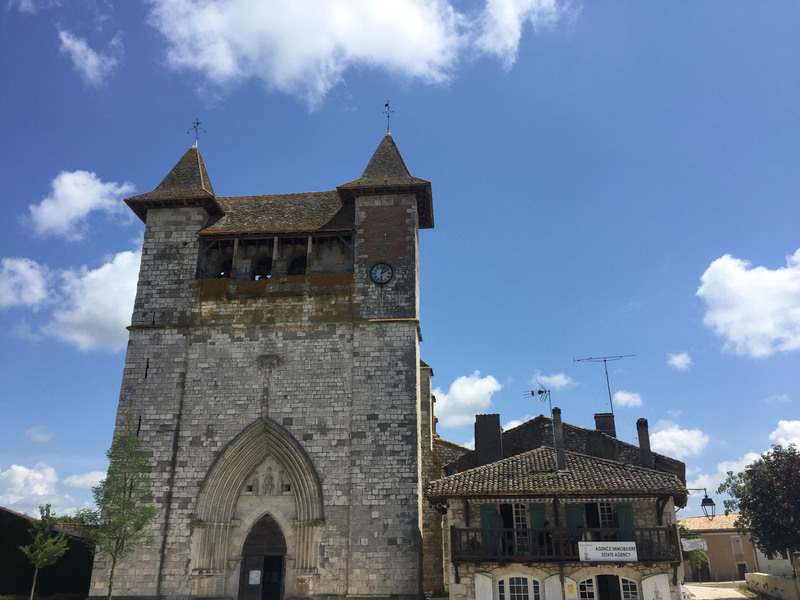 On our third day here we had to drive north into Limousin, to the village of Piégut-Pluviers to visit the notaire and sign the compromis de vente for our new house. We met the sellers, fellow Brits Julia and Paddy, beforehand in the small market square and we all arrived together, to run through all the details of the sale contract. 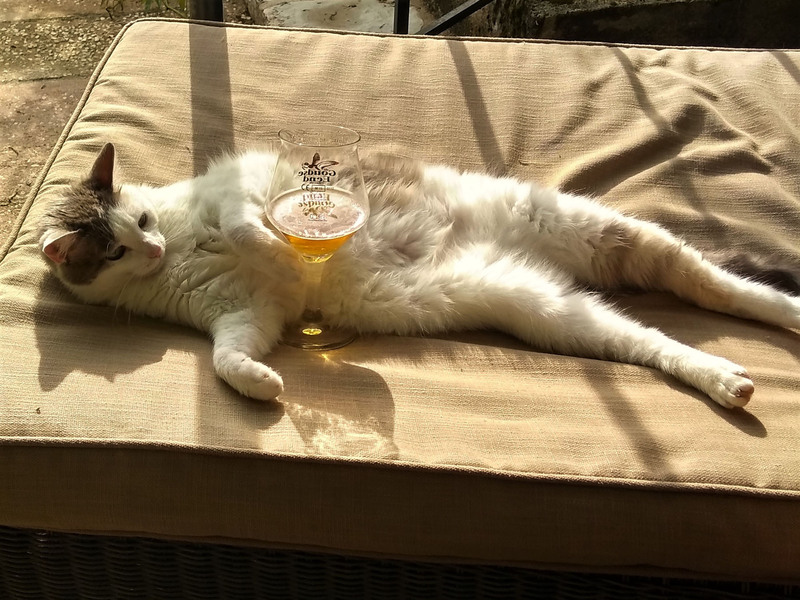 After a busy few days, it was time to properly relax, at least how we like to. 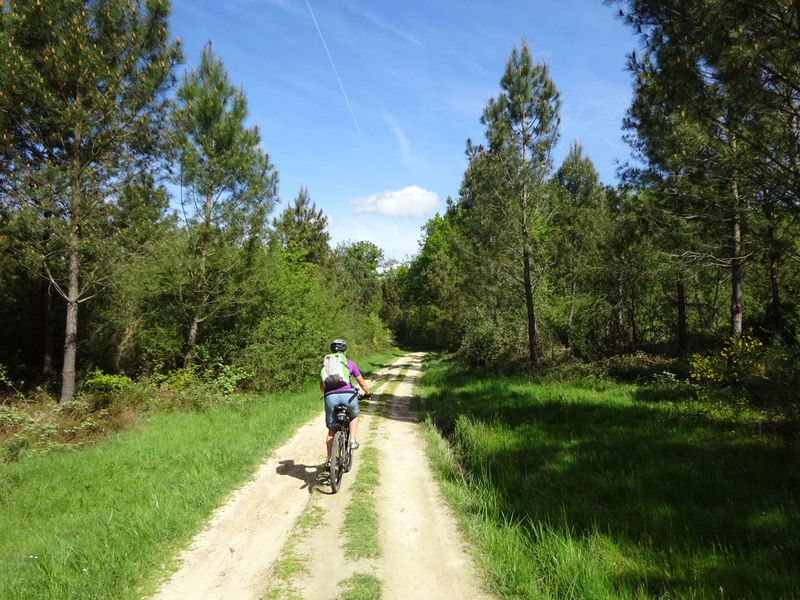 We cycled 10km on small, empty roads and cut-up muddy tracks to reach La Jemaye, and even on this lovely sunny day there were only five cars on site, their huge parking areas mostly empty. 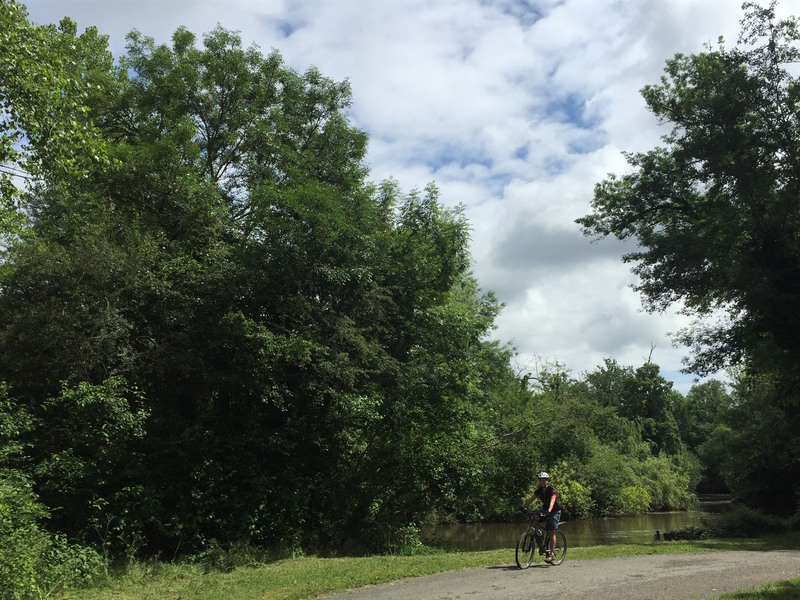 We cycled a full loop of the lake first, around 7km, then on our second lap we found a quiet spot on the bank to stash our bikes, quickly changed and enjoyed a wonderfully welcome lake swim. The water was much warmer than we were expecting, a real bonus this early in the season, and we were so excited about having this facility as a local venue. We had a few short, exploratory runs into the local village of Vanxains, and discovered a lovely, if hilly, 8km route around the local roads. This became a staple for us; we walked and ran it many times in both directions, with occasional variations. Being static for six weeks definitely has its advantages. 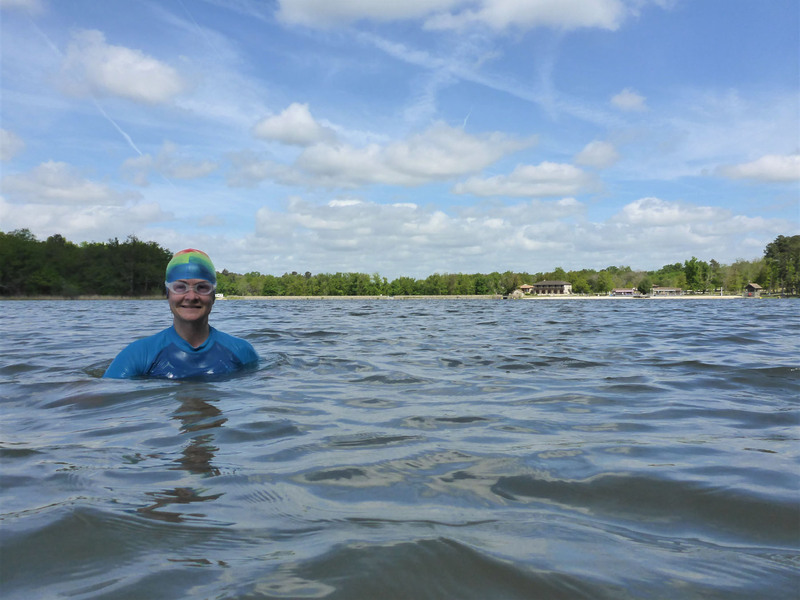 It was Nicky’s birthday during our first week in the house, and as part of our celebrations she chose to return to the lake, this time driving down to continue our training for our upcoming Swim-Run event in June. We found there were lots of well-kitted fishermen setting up for the day, like there was a competition on, so it was complicated to find a spot to enter the water without disturbing others. We ran around the edge of the lake from the motorhome parking to a quiet bank at a smaller lake, swam around 200m in reed-lined tranquillity, then climbed out the opposite bank and ran on. A few kilometres later we found another suitable place to swim, completed a shorter 150m swim, then got back to running. It was for us a chance to get used to the transition, and to swimming with trainers on and then running in wet gear. It felt good, much more comfortable than expected and we loved the easy switch of emphasis from using legs to using arms. One evening our intensive post-exercise sun-bathing was interrupted by an unexpected knock on the door. Our British neighbours Liz and Graham had called to offer us an invitation to apéro at theirs, pre-dinner drinks, and we soon tidied ourselves up and obliged. 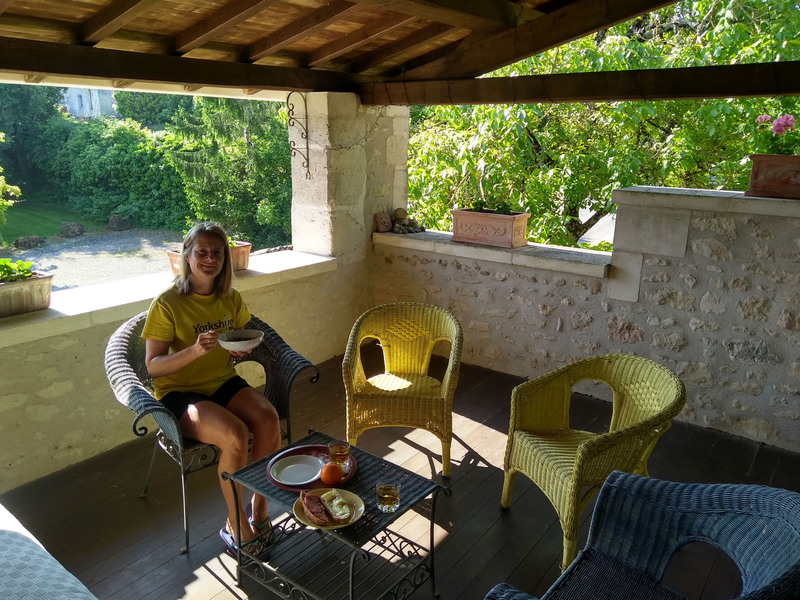 We were given a short tour of their beautifully converted barn holiday-home, complete with spectacular views from the covered first floor terrace, then we sat in their garden in the evening sun, answering questions all about our travels as we got slowly toasted. It was wonderful to meet them. 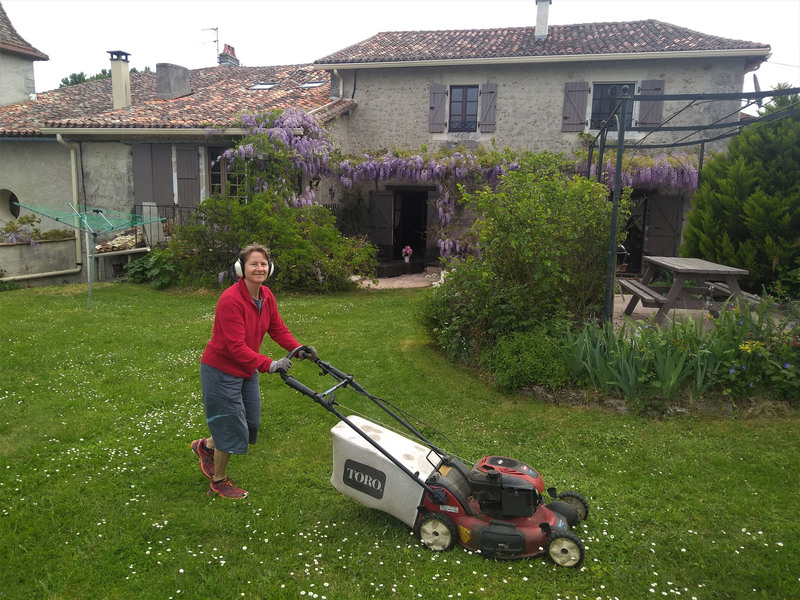 Other days, between long countryside walks, runs and cycles, we pottered around in Eric’s garden, grass cutting, clearing out the garden sheds to make then more usable and manageable and generally keeping everything tidy. It was such a peaceful location, set at the end of a long lane, not overlooked, and we loved to chill with a glass, admiring the garden and the view. 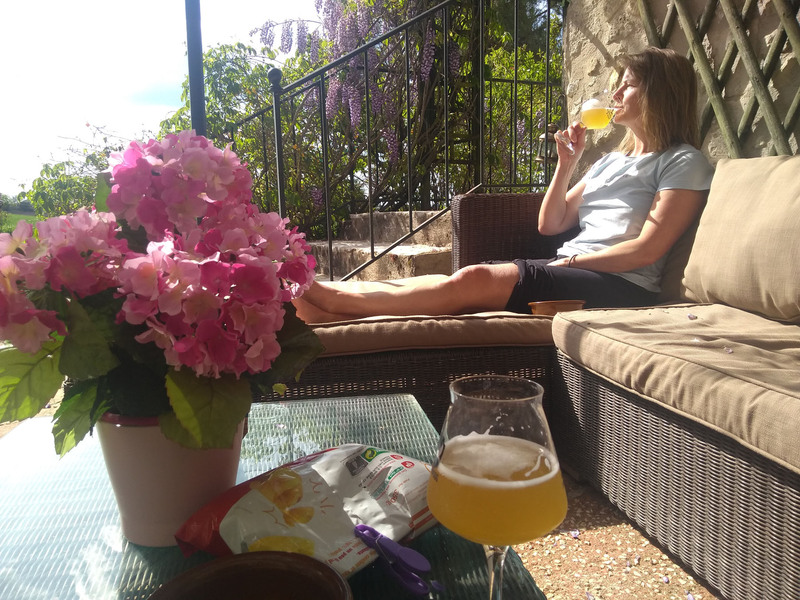 This entry was posted in 2018 Summer Tour, Cycling, Hiking, Housesitting, In France, Our Travel Journal, Swimming and tagged apero, cats, Cycling, gardening, gardens, Housesitting, lake, lake swim, markets, nature, relaxing, Swimming, trail running, walking, wine on May 28, 2018 by Aaron Hill. 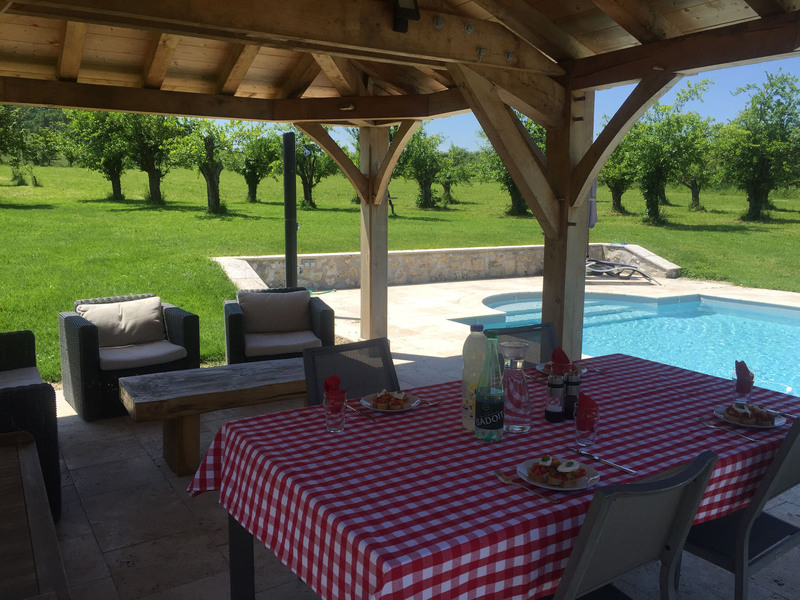 Our very lovely house-sit in Cazeneuve finally came to an end, as all things must do. We had a final dinner and beers with our returned hosts, hearing tales of their travels and sharing our experiences of our time in their beautiful home. A final clean up and packing up session after breakfast the next morning and we were off, sad to be leaving our cosy nest but also eager to be back on the road in Benny, our first real trip out in several months. We headed north, our first stop a call in to meet the host of our next house-sit, beginning in mid-April. After a missed turn and then a rather wild trip through managed forests on single track lanes with tall grass growing up the middle, we finally arrived. 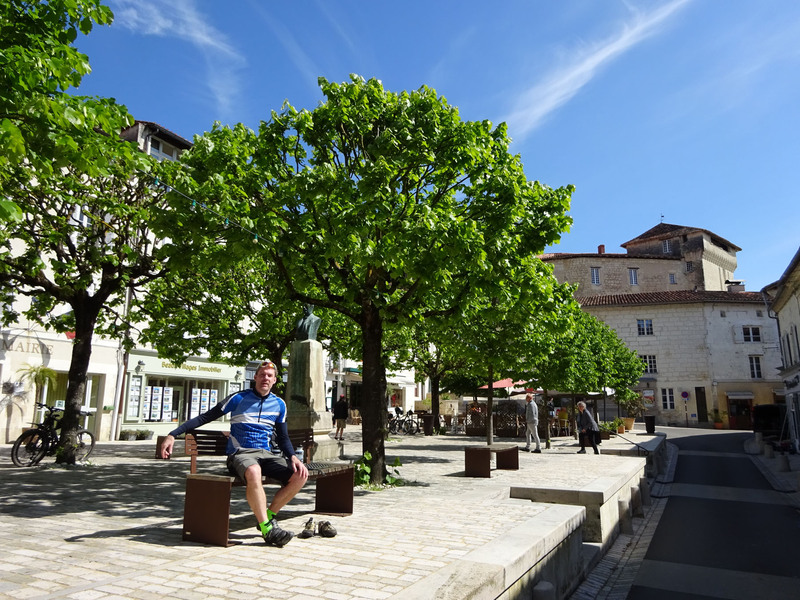 We spent an hour with our host Eric, a fellow Brit who has lived near Ribérac for many years but who now splits his time between it and Montenegro. We had a tour and a tea, and got an initial feel for the house, the immediate area and the neighbours. We also met our new masters, two proud cats who we will dote on for our six week stay, if they are predisposed to let us. We are also hopeful of some good, warming spring weather for our long days there, as they would bring our first experience of perfect summer days we hear tales of. 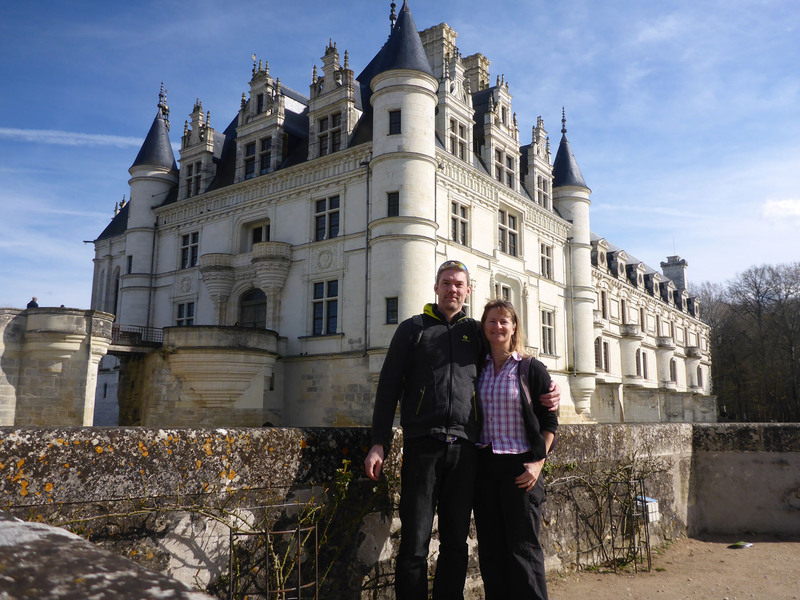 From Eric’s, we continued north and then east at a leisurely pace, stopping to visit Hautefort château and town, along with other places that caught our interest. We had arranged to meet various agents who would show us select properties, arranged over two days of viewings. It was raining for most of the time, but at least we were seeing them at their worst, and not being seduced by glorious sunshine. 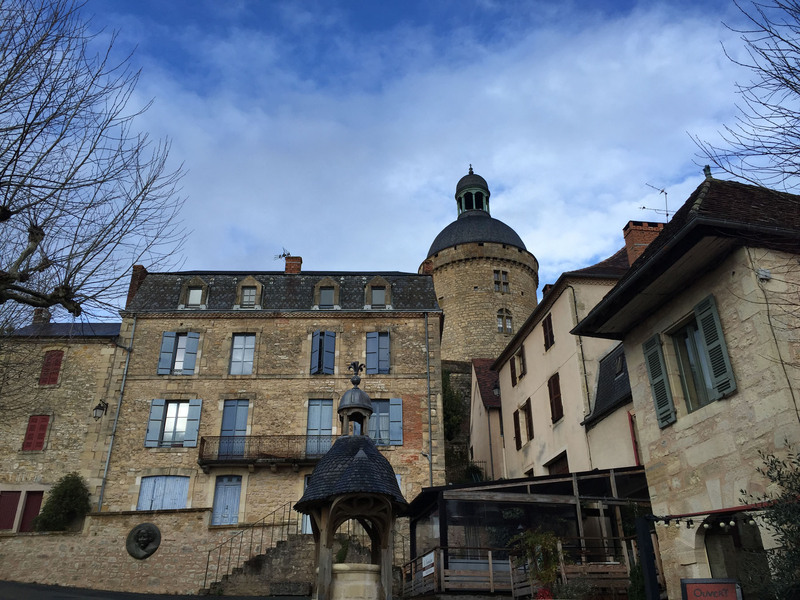 We ended up viewing five very different properties as we passed through Limousin, giving us a feel for what we can get, or more importantly what we want to get, for our money. Nothing yet pinged our ‘must have’ urges, but some interesting possibilities arose and we came away with a bit more clarity on our expectations and desires. We’ll return to the house-hunting in April with gusto. With persistent rain and grey skies following us as we made our way north, we had only one dry, clear day on our route home. 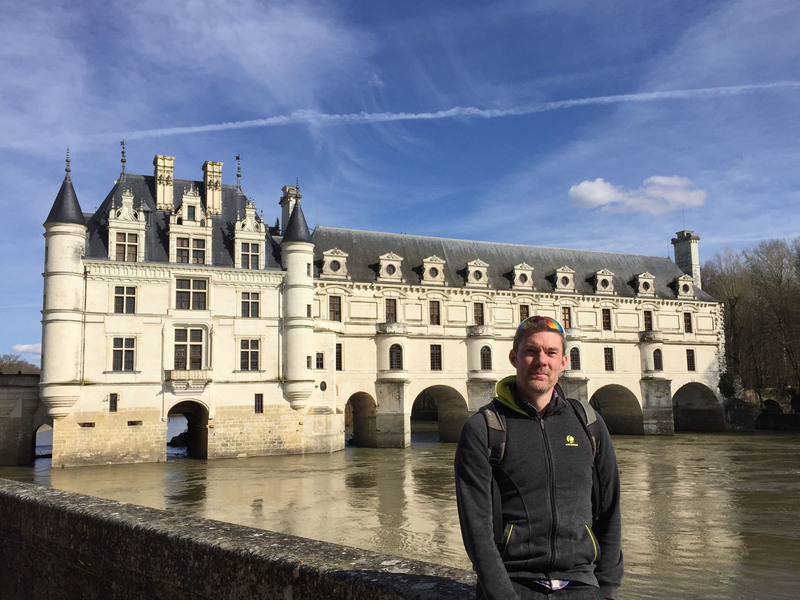 Happily, this bright but still chilly day coincided with when we were passing through the Loire valley, so with minimal diversion we called in to visit the impressive Château de Chenonceau. After a false start dashed our plans to picnic in the grounds (no food allowed, bags thoroughly checked) we ate outside then made our way under the arched canopy of trees towards the formal gardens. 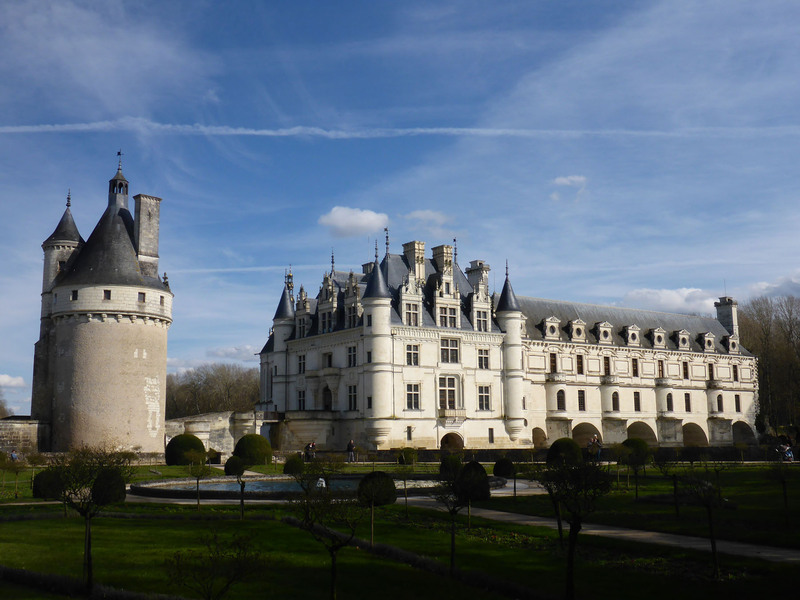 To delay the big reveal, we cut left into a small maze and, after a short loop through pretty woodland, we arrived at the north bank of the river Cher, at the back-left corner of the formal gardens, allowing wonderful views of the tall château as it spanned out across the river on stone arches. 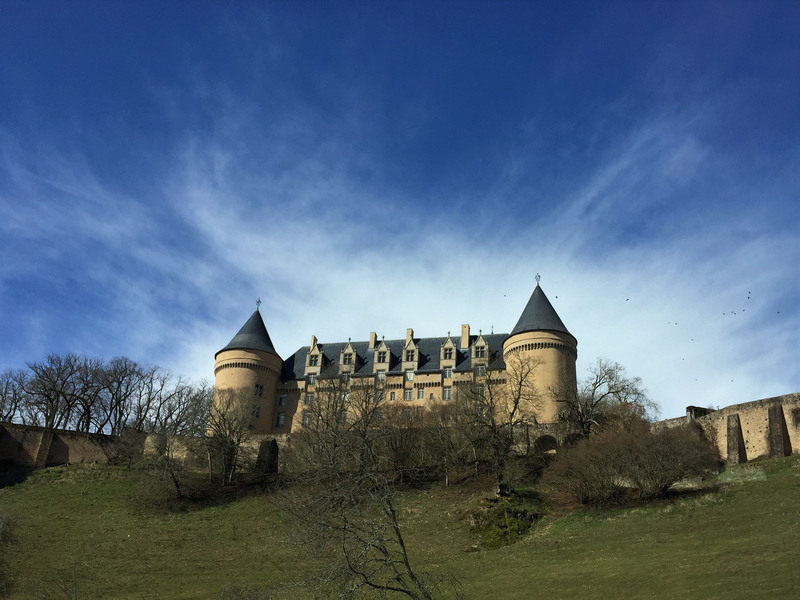 We skirted the edges of the gardens as we approached the château, admiring the setting framed by a deep blue sky streaked with white cotton clouds. 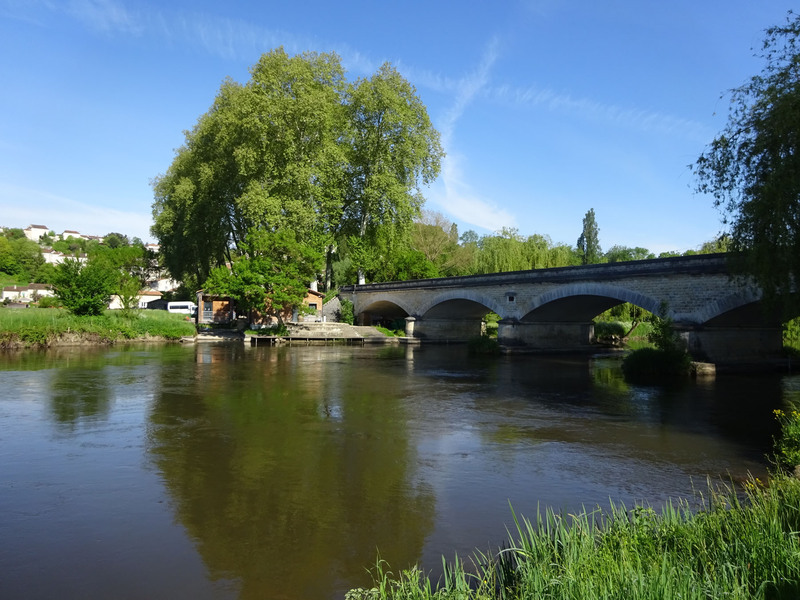 Our Wild Swim France book lists a curious swim here, starting from the publicly accessible south bank of the river Cher – the river was flowing wild on our visit, but we may partake on our way back south. 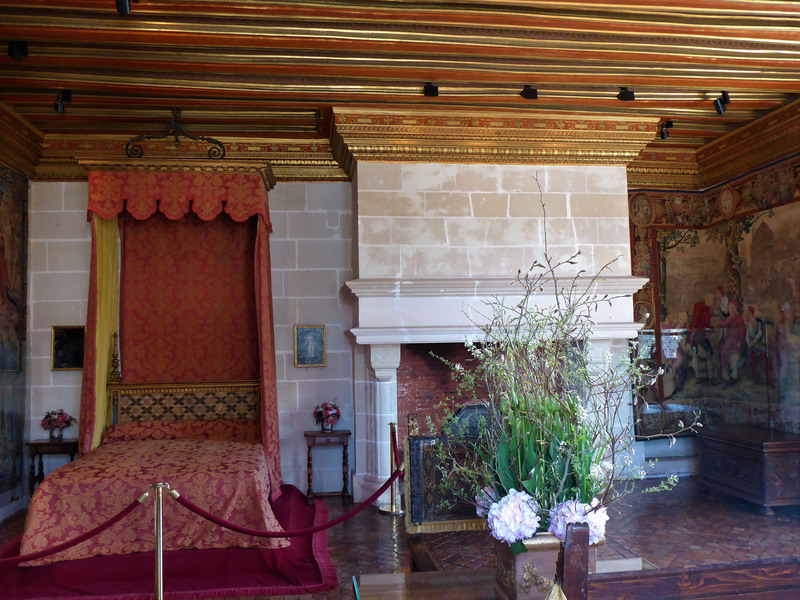 We continued our tour inside, visiting most of the bedrooms, state rooms and kitchens on our route. 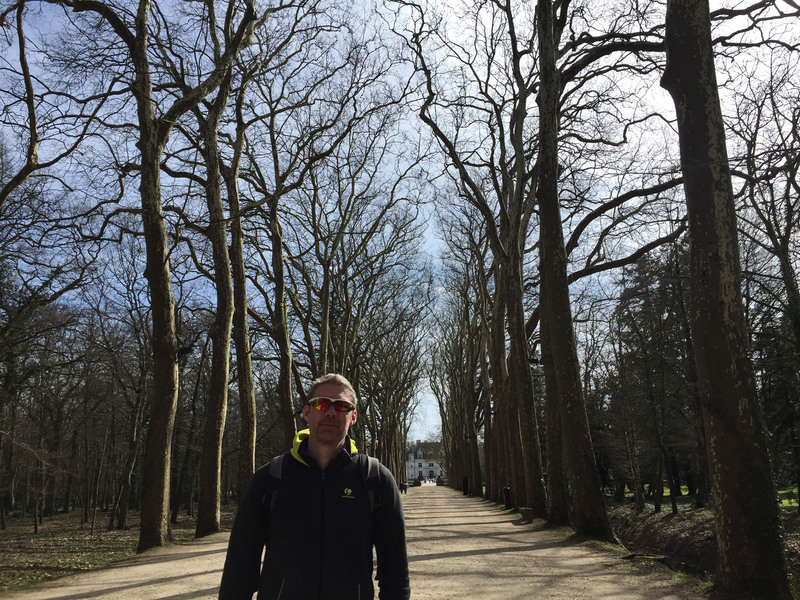 We wandered back into the gardens, passing rows of many heavily pollarded trees coated with thick moss, to visit the 16th century farm buildings. 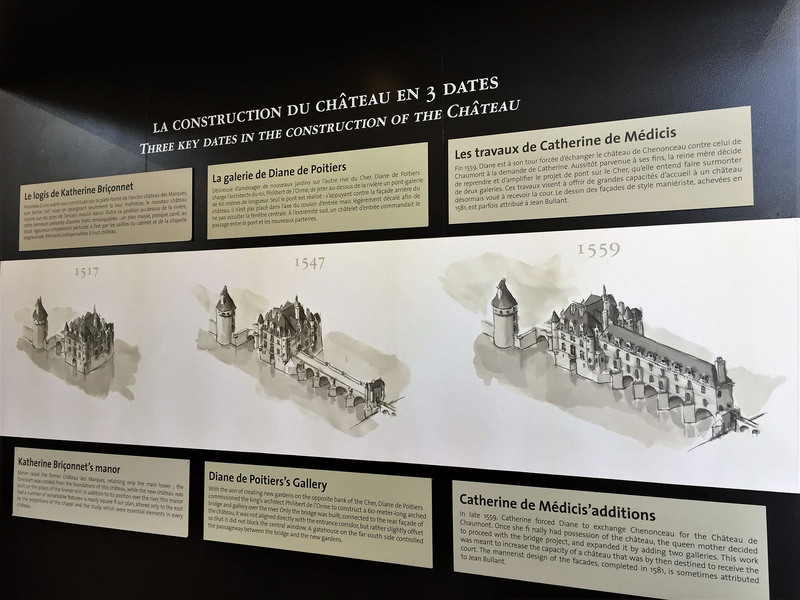 These once housed the extensive staff required to tend the grounds and produce all necessary food for château guests. There were large barns filled with buggies, carriages and old farm implements. Two days and a very early ferry journey later, we were deposited back in the UK at Newhaven for a busy month of visiting, shopping and servicing. These are always the few hectic, expensive but wonderful weeks that refresh, renew and exhaust us in equal measure, but also allow us to enjoy the simple freedom during the rest of our year. It is also great to catch up with friends and family, with multiple stops this time all over England and Ireland, in between all the pre-organised events – Benny’s service and habitation check, fitting of new tyres, attending birthday parties, visiting dentists & opticians, training runs and much needed shopping trips to replace worn out gear. 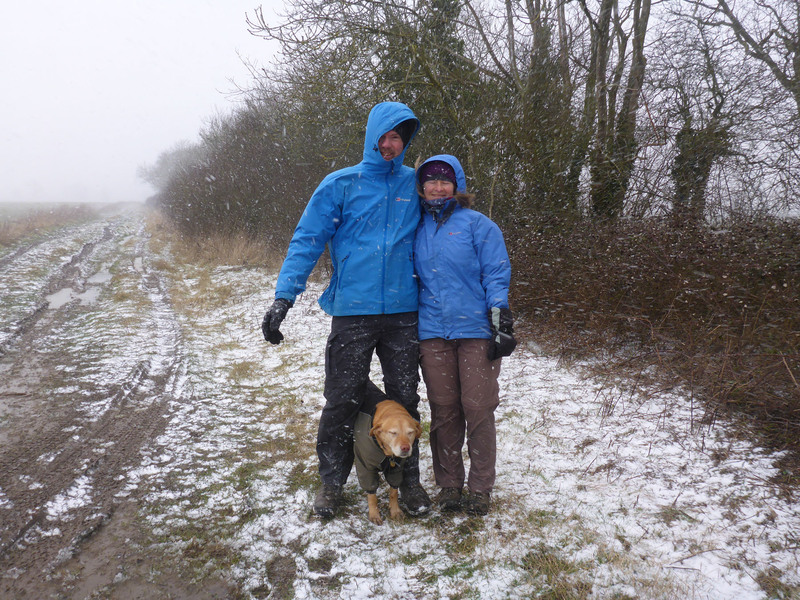 We’ve also had to deal with some proper Blighty weather since our return, braving snowy storms and wild rainy weather when out on walks and runs. 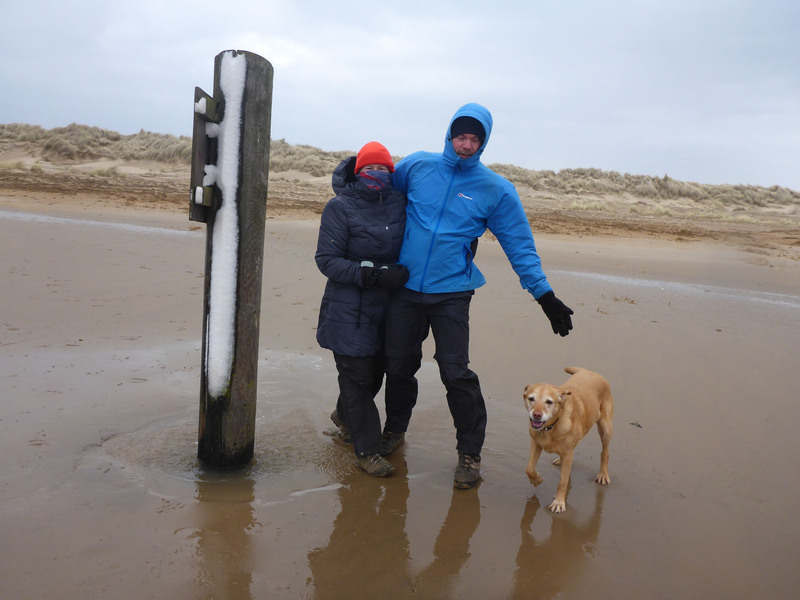 It’s been a good reminder of the weather we are hoping to avoid in future years with our proposed move to France. 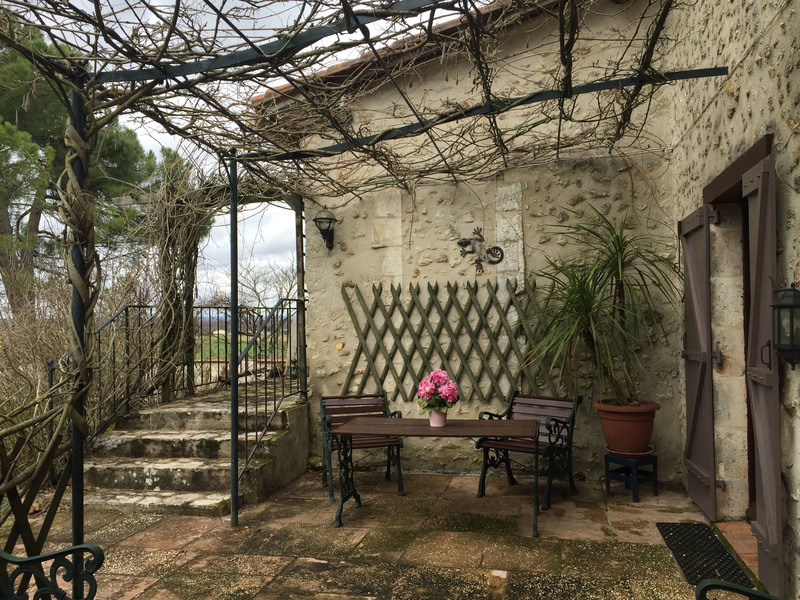 This entry was posted in 2017 Winter Travels, France, Housesitting, In France, Our Travel Journal and tagged architecture, beach, chateau, ferry, gardens, history, househunting, Housesitting, rain, wild swim on Mar 20, 2018 by Aaron Hill. With very few good weather days over the past few weeks, we have had to be ready to jump when the mists lift or the clouds depart enough to allow a little sun through. 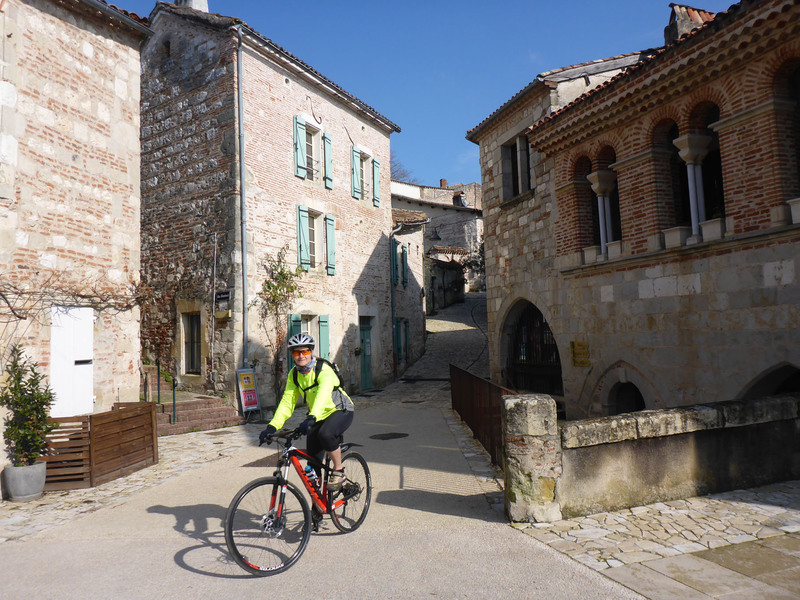 One morning we rushed out to cycle to the nearby village of Castelmoron-sur-Lot, taking advantage of a bright, clear start to the day. 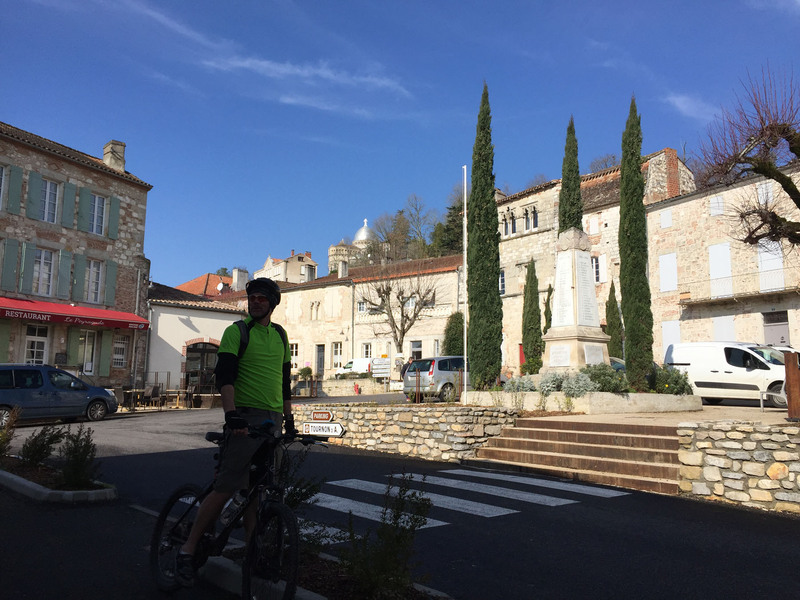 We first cut across tiny country roads with absolutely no traffic to join a dedicated voie verte in the settlement of Temple-sur-Lot, stopping briefly to take in the church and the eponymous castle, now seemingly made into residential apartments with shops and restaurants on the ground floor. 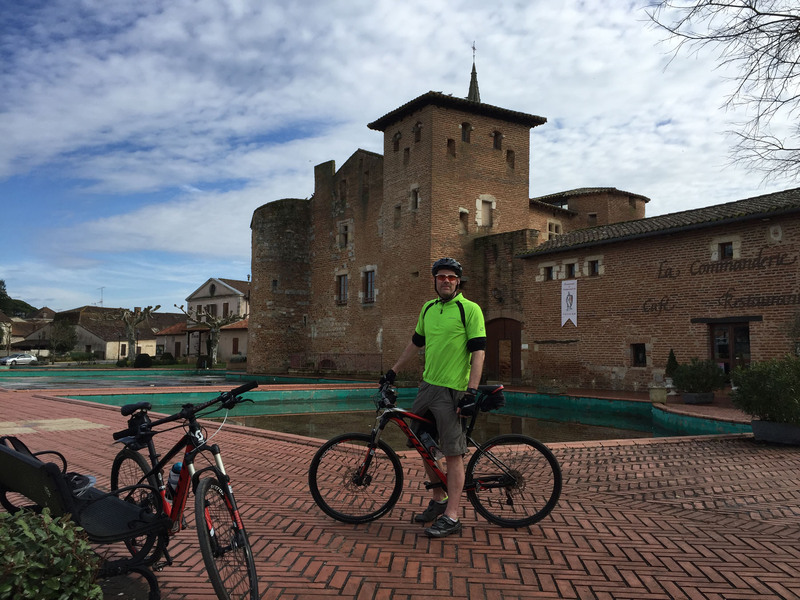 From here we rolled on into Castelmoron, crossing the iron bridge and circling the central sights. 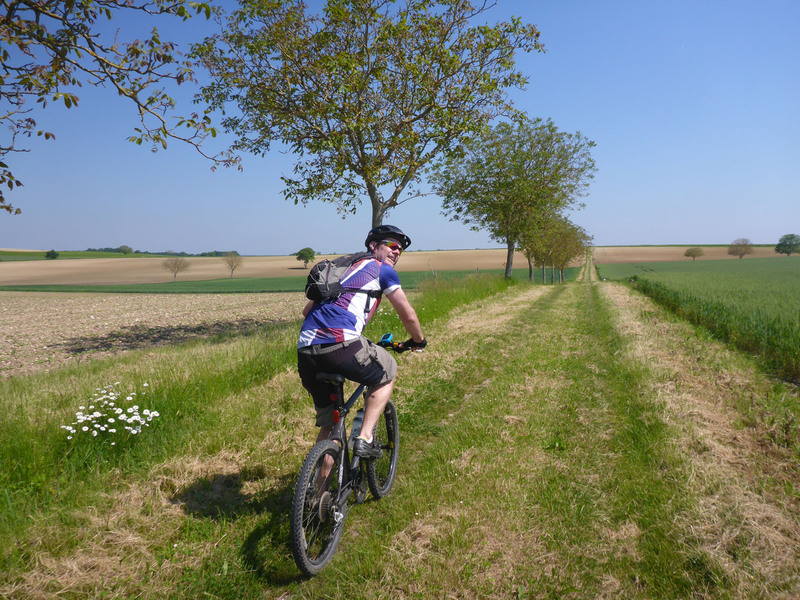 We left the town hugging the north bank of the river, following the voie verte back towards Sainte-Liverade. The sun was bouncing off the still water, creating beautiful reflections of the opposite bank. We stopped off in the centre of Fongrave, where we found a small cantilevered viewpoint behind the church, looking out over the river and beyond. We paused a while to soak up the view, feeling so pleased we’d made the effort to get out and see this stretch of the cycle-path. We watched a van with a trailer awkwardly launch a small rib-boat into the river via a concrete slip, before continuing happily along the sunny, tree-lined banks. 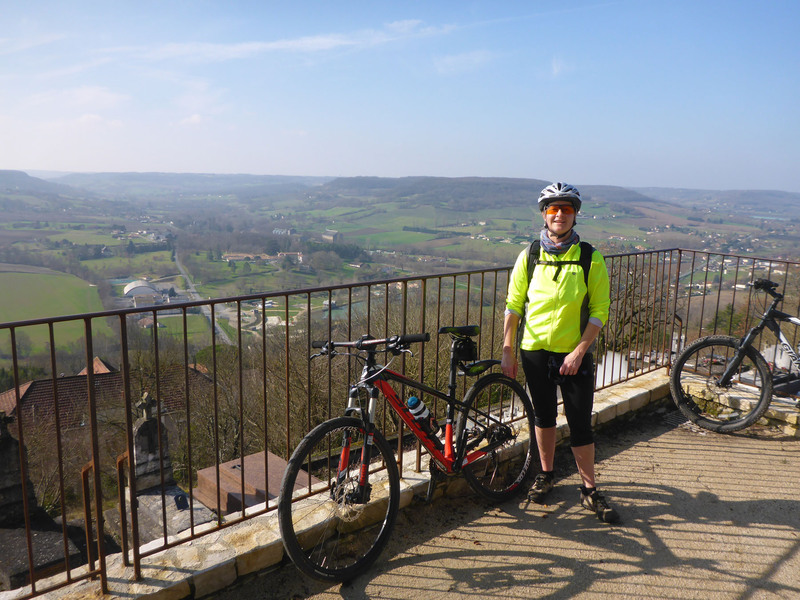 We closed out our loop just before Sainte-Liverade and returned over the steep hill to Cazeneuve, contented with our morning activity. One later morning we awoke to similar bright skies, yet with a deep cold in the air. The air temperature was stable around 3degs C, but could feel much colder when the wind blew strong, or very much hotter when the radiant sun directly reached your skin. 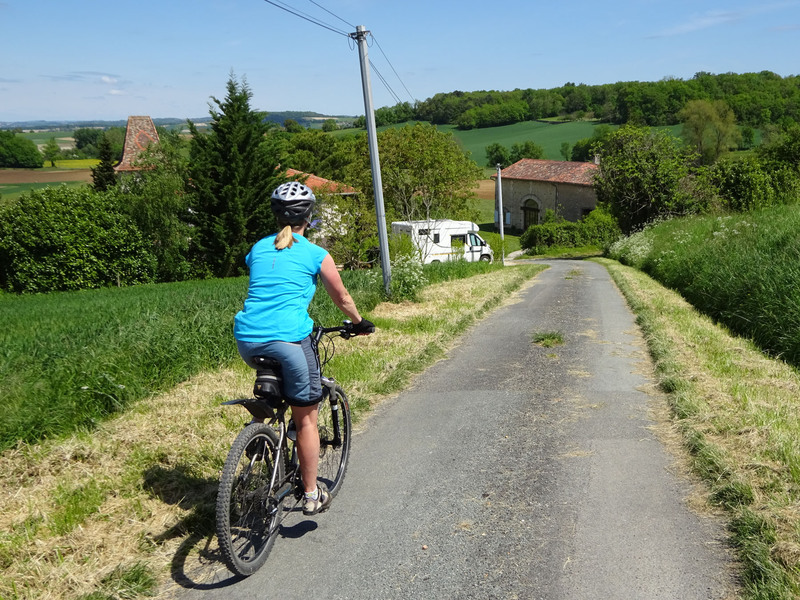 We headed off in the opposite direction to our previous cycle, over to the next valley hills to join the voie verte near to Villeneuve-sur-Lot, heading east. 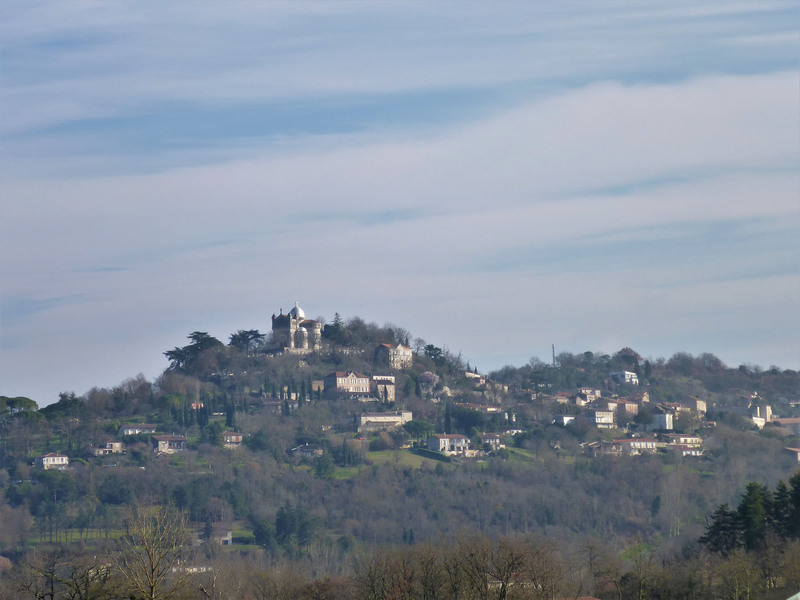 We lost the path on the outskirts of town, so made our own way along quiet country roads in the general direction, bending round woodland and up some steep, forested inclines to catch our first glimpse of the hilltop town of Penne d’Agenais, standing proudly on the far horizon. 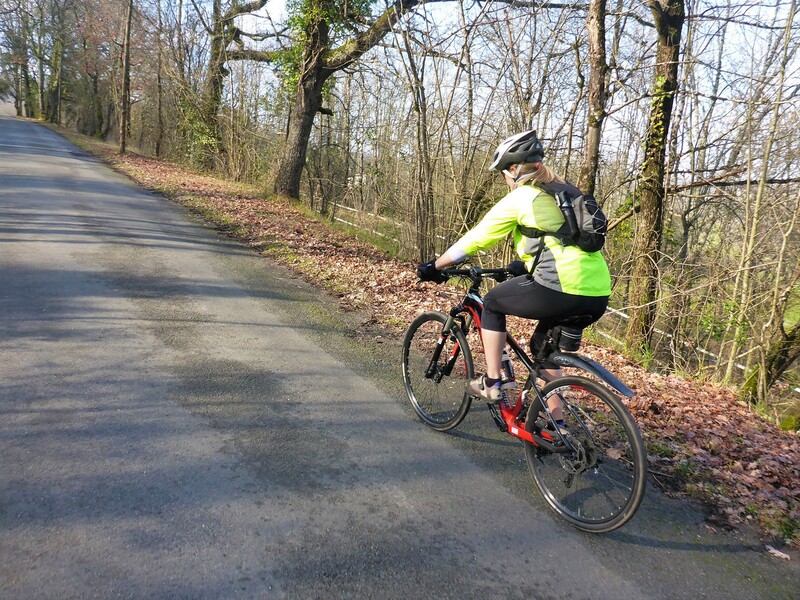 The cycle and final climb was reminiscent of a long cycle back in Portugal, heading to Monsanto, where we could see our target from miles away. We made our way onwards and upwards, ever upwards, snaking around the sides of the hill as we climbed to the town. We slowly closed the distance to nudge ourselves to the very top, with the expectation of the upcoming view acting as a welcome reward. 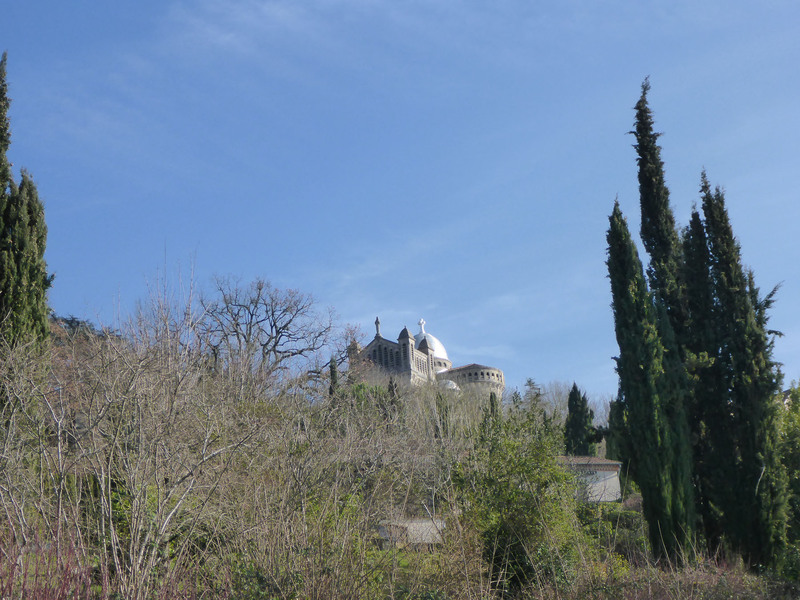 Penne d’Agenais, a fortified medieval village set high on a steep hill with outstanding panoramic views, was topped off in grand style by the metal-domed Notre-Dame de Peyraguade. 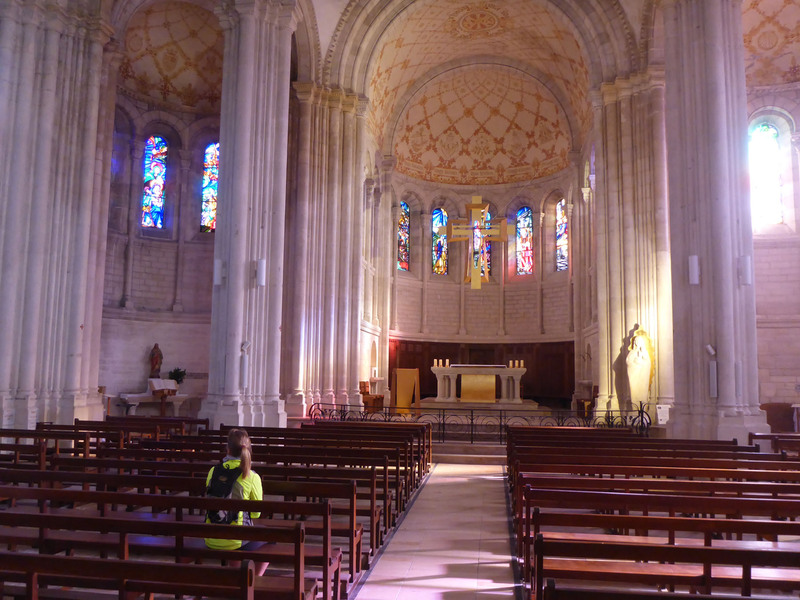 This was a huge basilica that had been positioned on the site of a 13th century castle built by Richard the Lionheart, itself on the site of an original 11th century chapel. 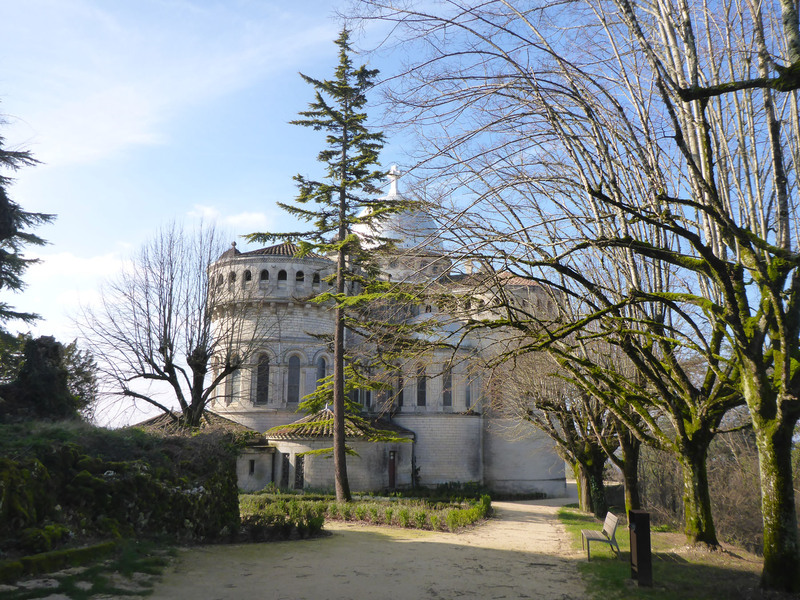 The sanctuary forms, as many similar places do, another key stopping point on the pilgrimage route of Santiago de Compostela. The myriad routes leading to northern Spain dominate the European landscape and the historic built environment, shaping so much of what we have seen on our travels. 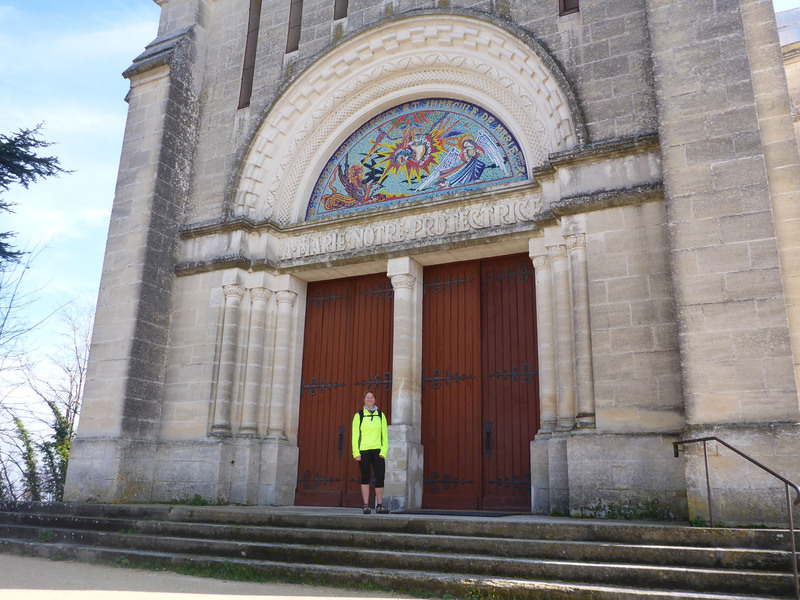 After a brief look around the town, we scrambled up the cobblestones to the plaza around the front of the sanctuary building. It was worth the sweat. 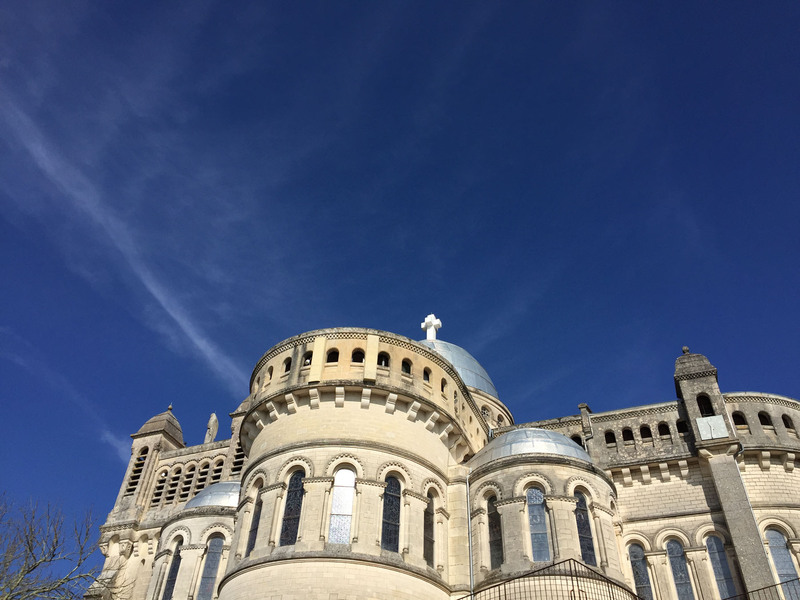 The expansive view over the shining, silver domes of the basilica and the nearby river was exceptional, and made all the better by us being the only people who had chosen to visit the village, and the sanctuary, this glorious day. We soaked up the view as we wandered around the grounds, before heading off to fully enjoy a super-fast descent down to the nearby town of Saint-Sylvestre-Sur-Lot where we stopped on a park bench to top up on snacks as we watched over the glistening river and the shining dome of the recently left basilica. 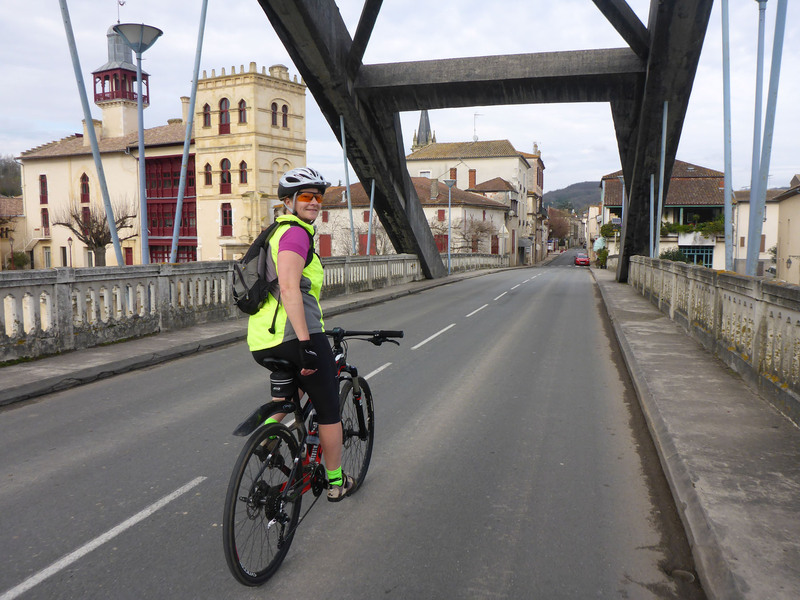 Then it was back onto the voie verte, north of the river and eventually into Villeneuve, before heading home again. We’ve been busy on other fronts too. Alongside our daily French language practise and training runs, we have been improving our table tennis, archery and pétanque, and more importantly, planning out the months ahead. 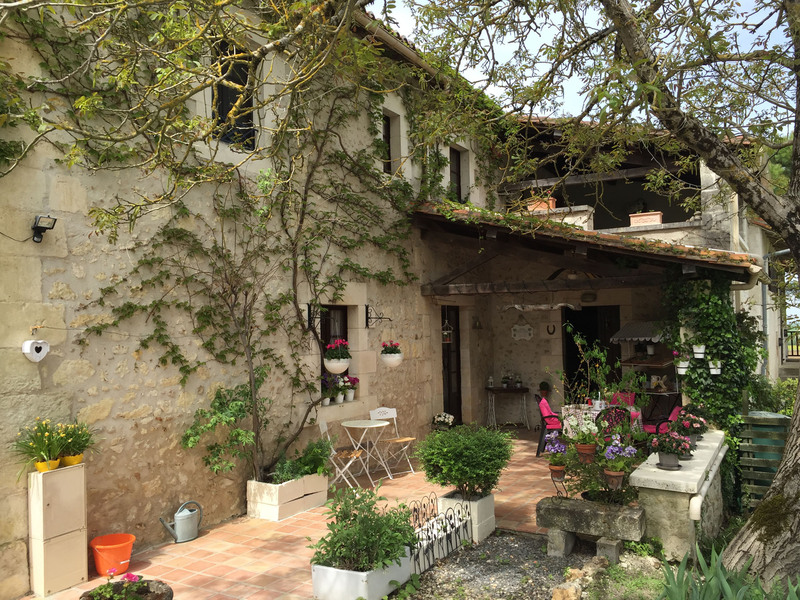 We have secured another French house-sit in May near to Riberac, a little closer to the area where we hope to settle. We have a few upcoming house viewings to try to get a feel for what we ultimately want to buy. 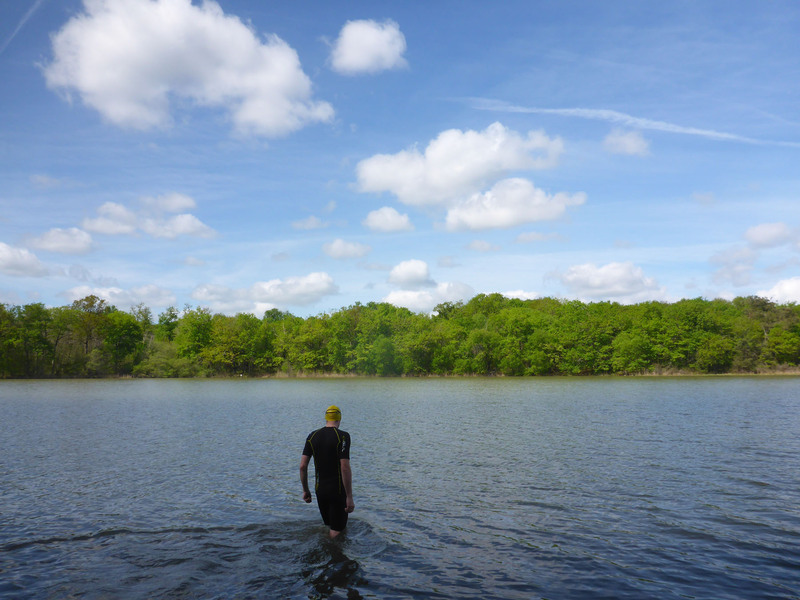 We have entered our first Swim-Run event in Lake Vassivière near Limoges, in June. 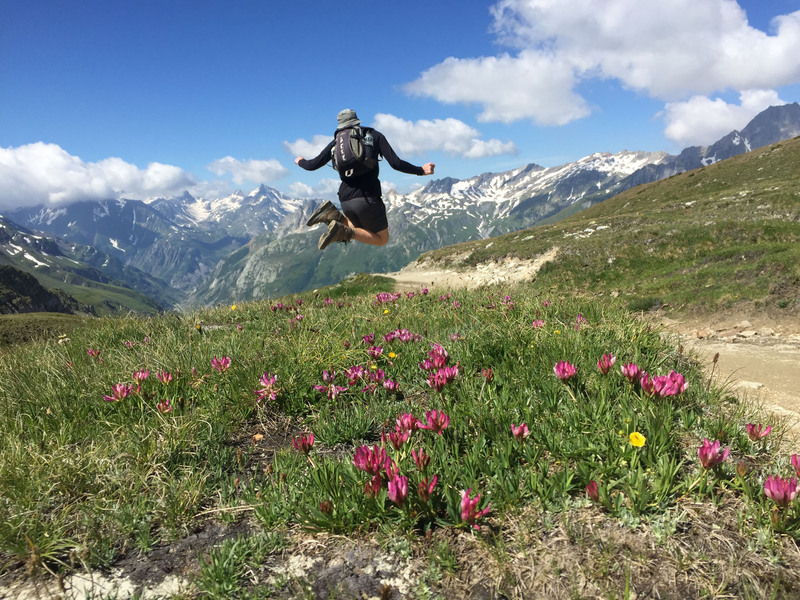 We have organised to walk the Tour de Mont Blanc circuit in early July, eleven days and 109 miles of glorious hiking in the high Alps, through France, Italy and Switzerland. Afterwards, we have vague plans for a quick scoot around northern Italy before returning to France to, hopefully, finalise the purchase of our chosen house. 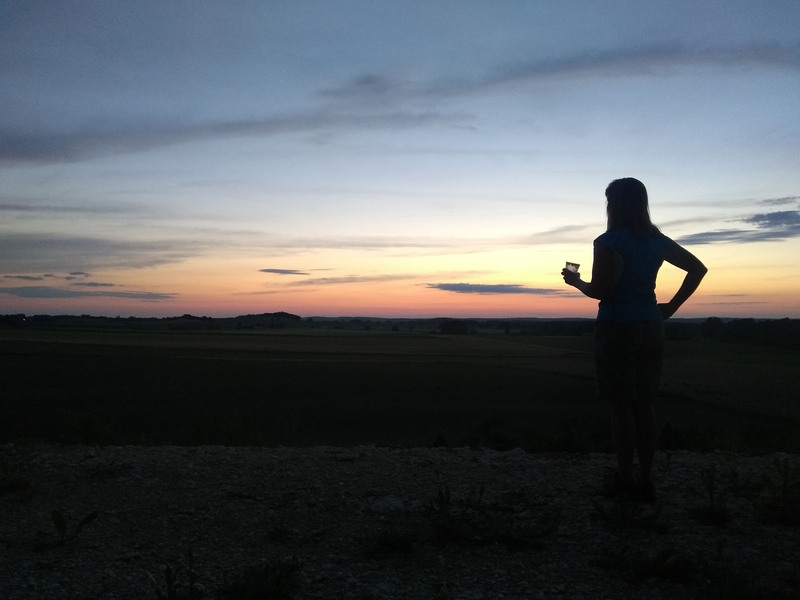 We have lots to look forward to, and surprisingly, this year will be our very first summer spent in France, so we will see it lit up in the full glory of summer sun for the very first time; we’re excited. 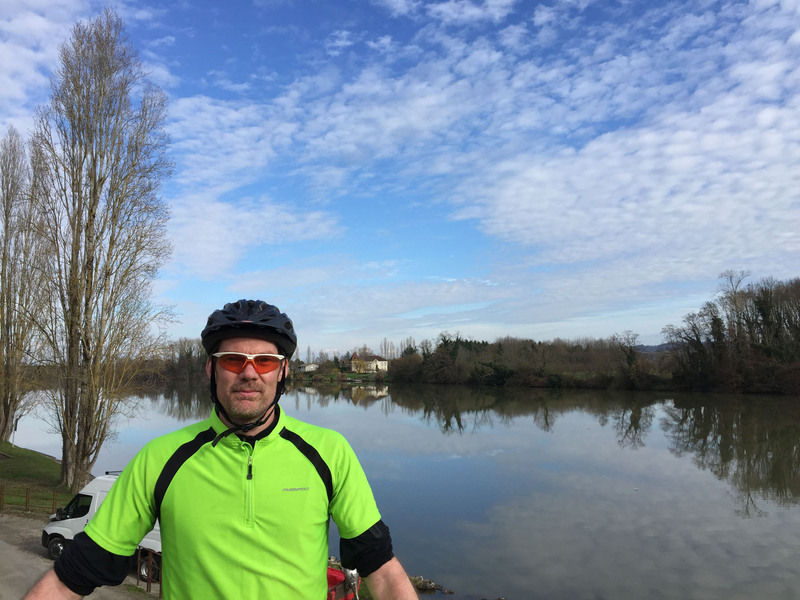 This entry was posted in 2017 Winter Travels, Cycling, France, Housesitting, In France, Our Travel Journal and tagged archery, architecture, church, Cycling, french lessons, hill climb, history, Housesitting, nature, river, sports, trail running on Feb 26, 2018 by Aaron Hill.